You don't need a Facebook Account to access our Facebook Page. 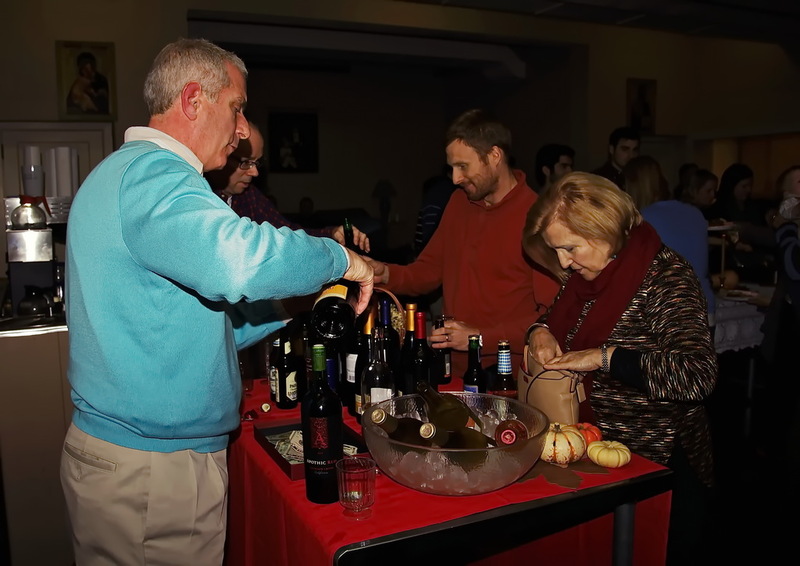 Joe pours out a good wine to bring out a really good meal! 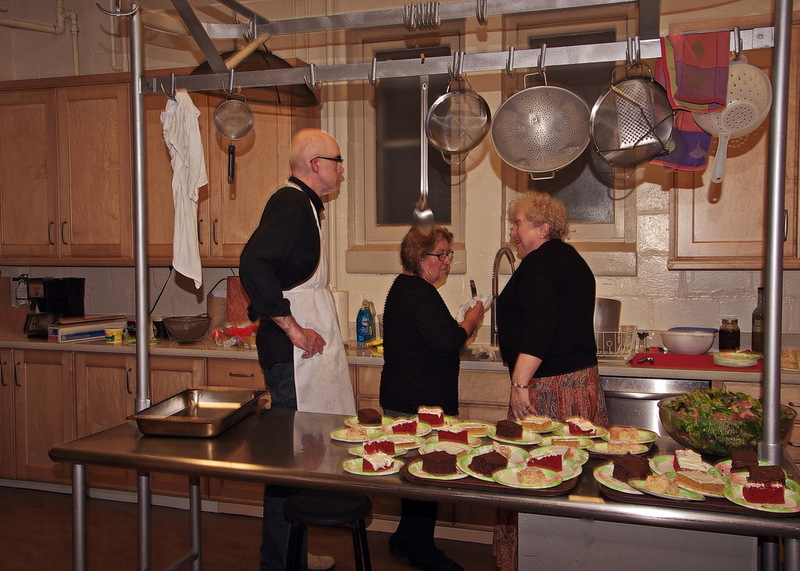 St Herman's annual Mittel European Dinner, featuring imported Chef Gene George's ghoulash ambrosia from his Czechoslovokian ancestry, marinated beef with spices over noodles, was served on the evening of November 7. Gene was a member of St Herman's when he and his wife lived in Minneapolis. They moved to Duluth a few years ago just so we could call him our imported chef and make an already scrumptuous dish scrumptuouser. Remember, small servings mean more food for the servers afterward! A bit o' wine gladdens the heart and preps the belly for a really good meal! 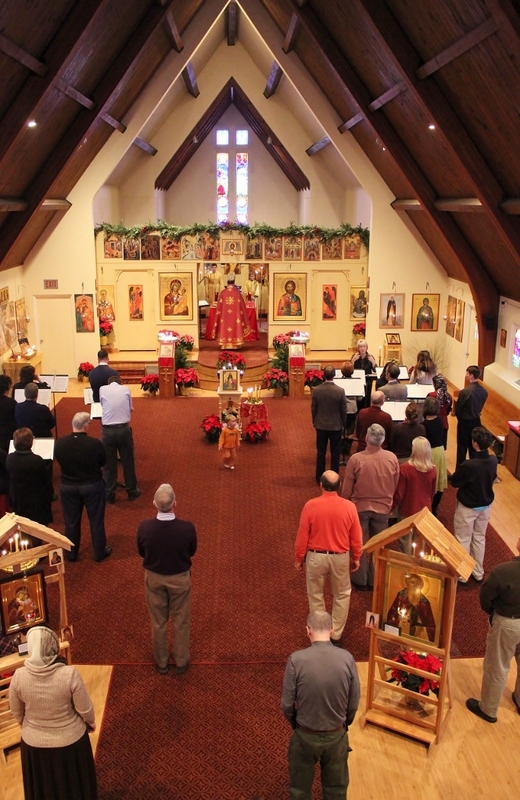 This was our 10th annual pilgrimage to Holy Dormition Monastery in Rives Junction, MI. 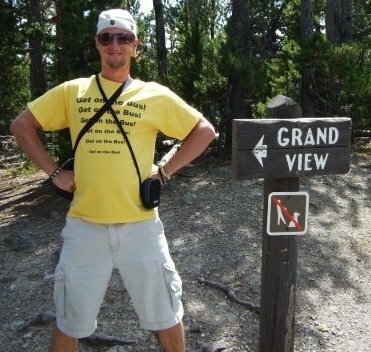 Our first pilgrimage was in 2006. These have become a highlight in the life of our parish. Our pilgrimage is always from Monday to Thursday the last of July. Sometimes, it spills over into the first days of August. 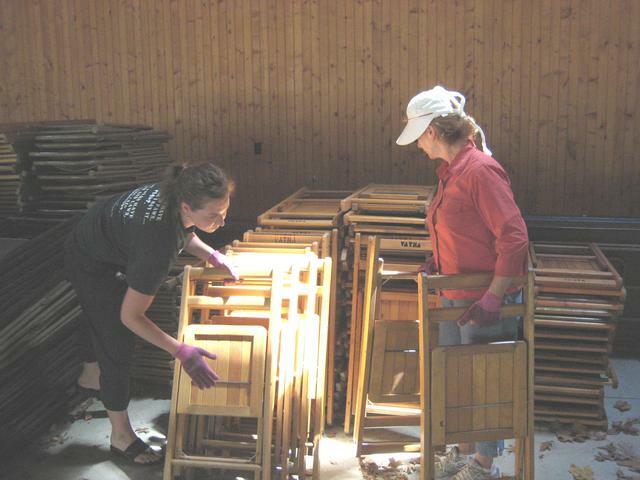 We go to help the Mothers & Sisters prepare the grounds and buildings for their patronal feast on August 15. But, we also go for the purpose of getting a taste of monastic life. The few days we are there, we enter into the rhythm of the monastic life to the degree we are able: eating, praying and working with the mothers and sisters. 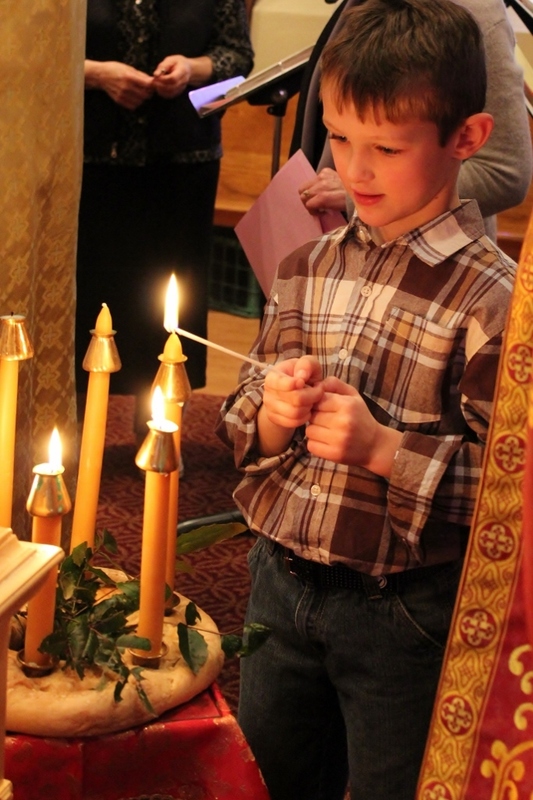 We light one candle each Sunday of Advent until by Christmas Day, all six candles are lit! One of our cherished local traditions at St Herman's is the "Advent Wreath". 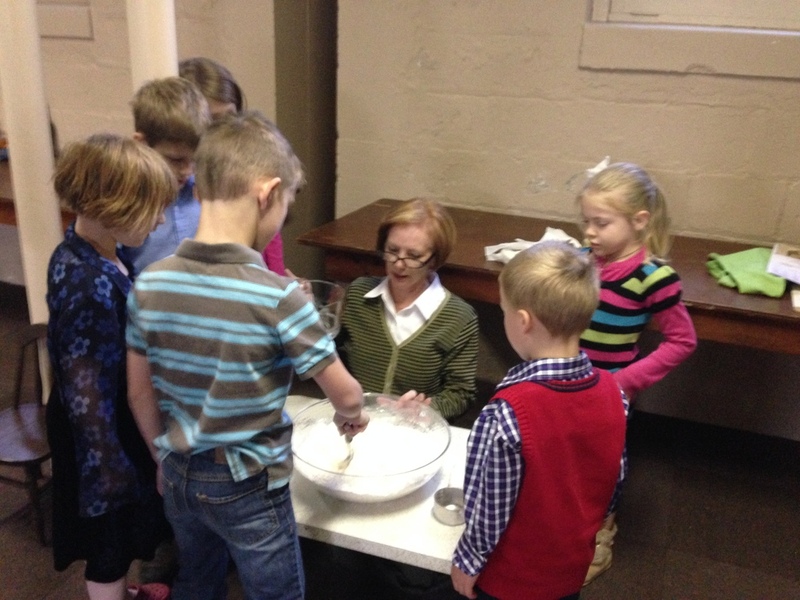 During the "Nativity" or "St Philip's" Fast, the six weeks before Christmas when we prepare ourselves for the coming of Christ with increased prayer and fasting, we mark the six Sundays of "Advent", the six Sundays of the "Coming" of Christ into the world, by making an Advent Wreath out of flour, salt and water. We then place six candles into the Advent Wreath. 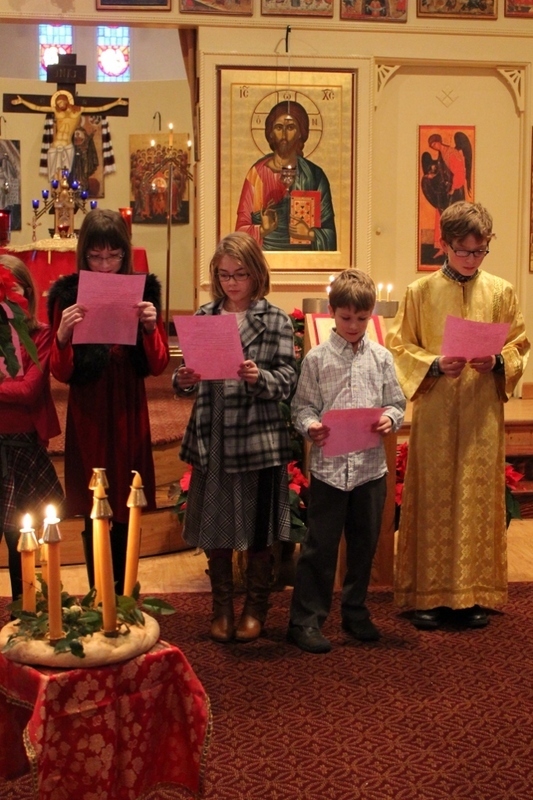 At the end of the Divine Liturgy, we light one candle each Sunday of Advent as we read verses taken from the feasts of Advent (Entry of the Theotokos into the Temple, St Nicholas, St Herman of Alaska) and the Forefeast of Christmas, so that by Christmas Day, all six candles are lit. Today, we lit three candles and rang the bell three times. That means there are three candles unlit. That means three Sundays to Christmas! We lit three candles. Three Sundays to Christmas! And, we rang the bell three times! SHY folk know how to sing Christmas Carols! St Herman's Young Adults are SHY. 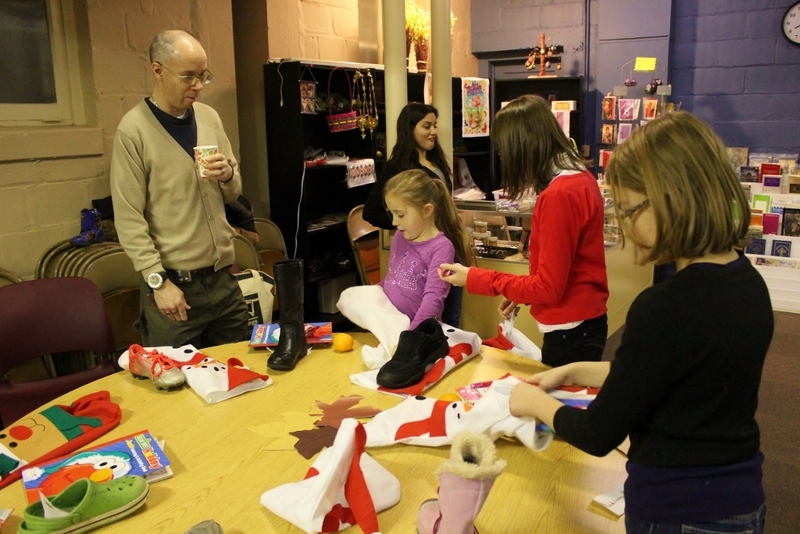 But, they often overcome their shyness by getting together to do fun things. 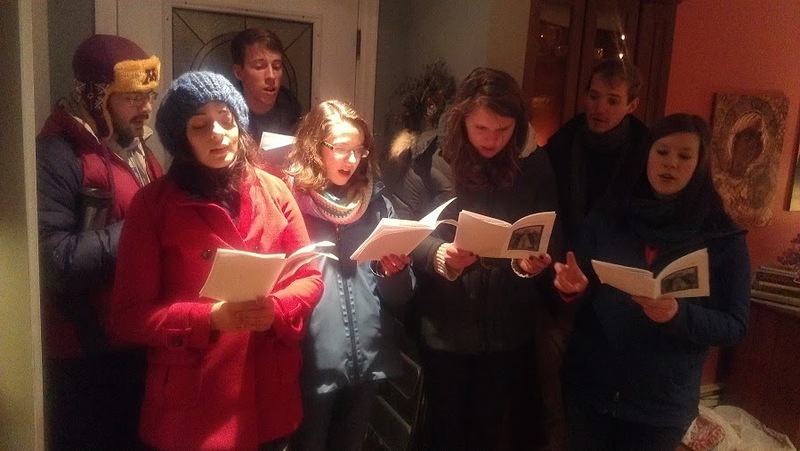 Sunday afternoon, Dec 15, they met at the home of Fr Paul & Presbytera before setting out to carol at the neighbors with Christmas carols. One of the neighbors threw some delicious mocha chocolate cookies at them! 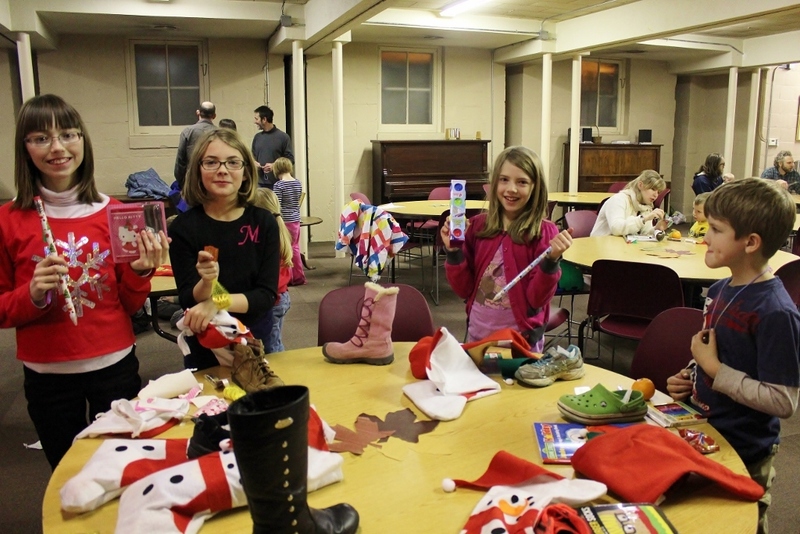 St Nicholas Day (Dec 6) at St Herman's is an "event"! How many adults are walking around with severe psychological disorders because of the trauma they experienced as a little child when they learned that Santa Claus is a fairy tale? 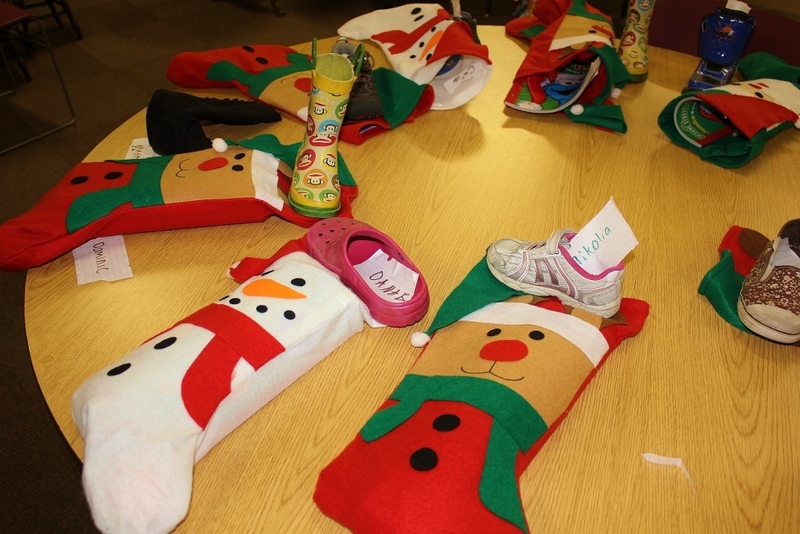 No such adults walking around at St Herman's, because we know that Santa Claus is not a fairy tale. He's real. But "Santa Claus" is a corruption (as it passed through several languages into English) of his real name, which is ST NICHOLAS! The real Santa Claus, St Nicholas, was a saintly bishop of the Orthodox Church in the early fourth century. 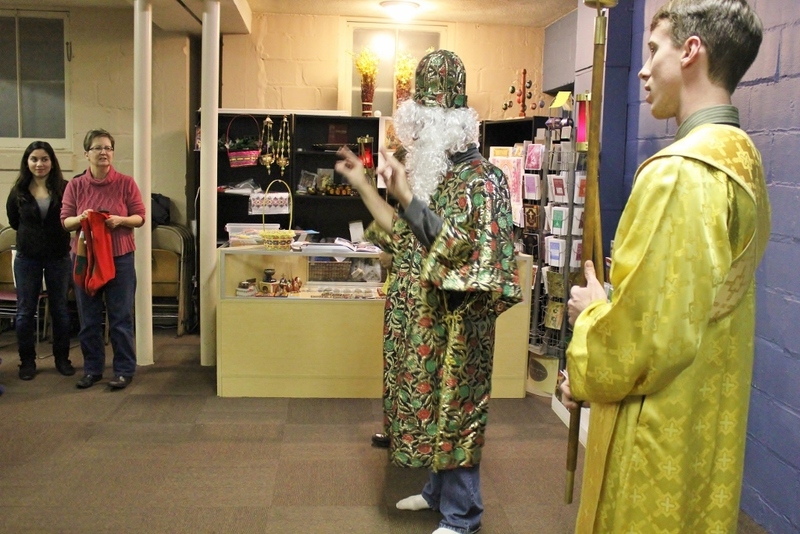 We have pictures - we call them icons - of the real Santa Claus, St Nicholas, all over our Church. They show him not as a jolly old elf with a stomach that shakes when he laughs like a bowl full of jelly. They show him as a man of noble bearing, not fat but slender, because of all the fasting he did. We have a parishioner whose "other" name is Mooky Kook. Her husband tells us its eskimo for, "Are you crazy?" 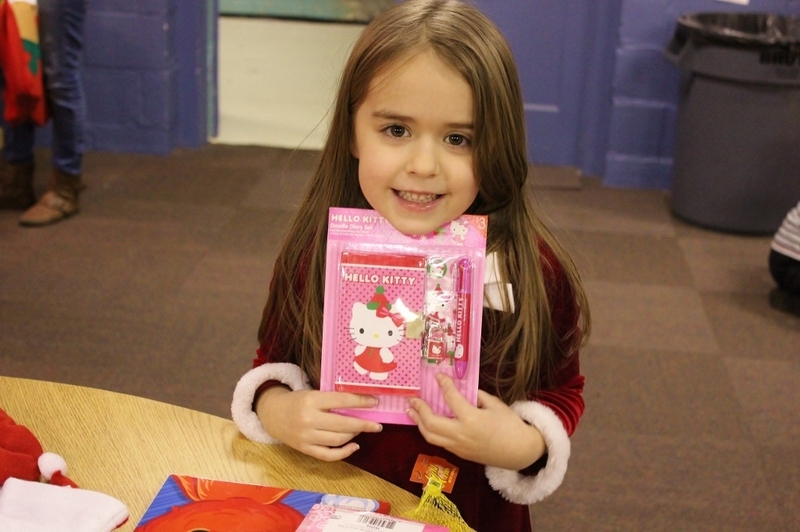 but she tells us it's eskimo for, "St Nicholas' Helper." 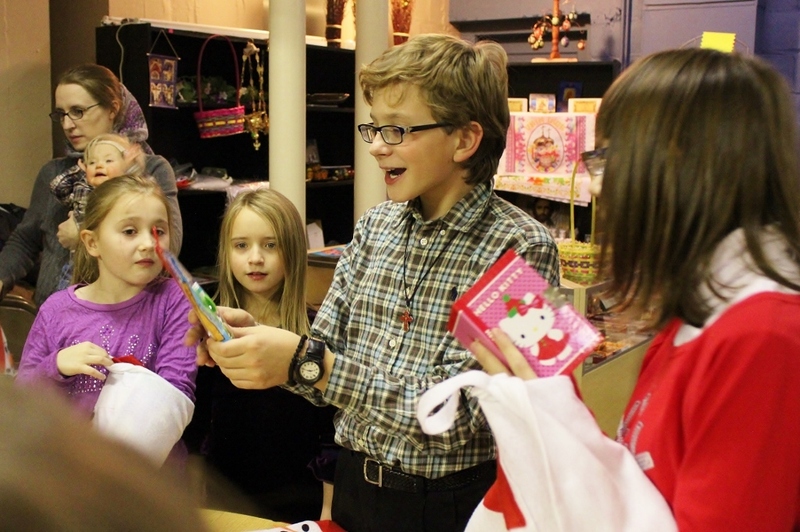 Every year, Mooky Kook works hard to help St Nicholas deliver gifts to the children of St Herman's. 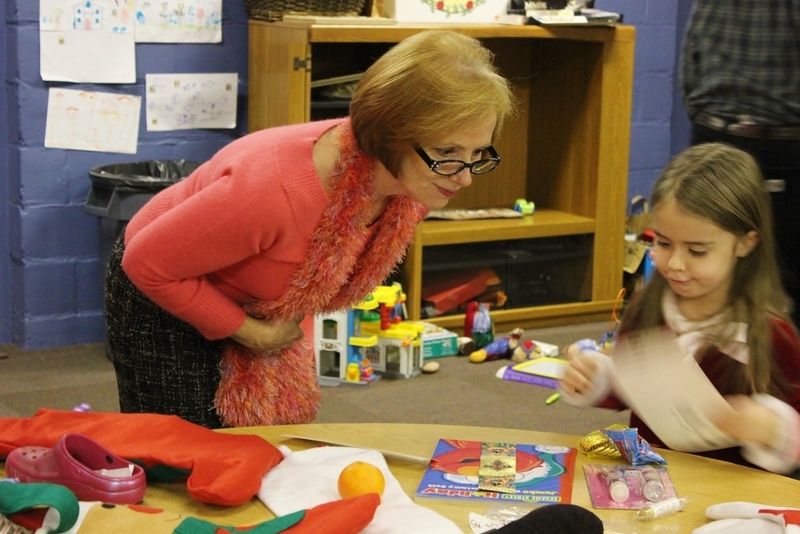 For her, it's a labor of love; and we love her for it. Hey, thanks, Mooky Kook! We're CRAZY for you! Blessing the food at coffee hour while hugging! 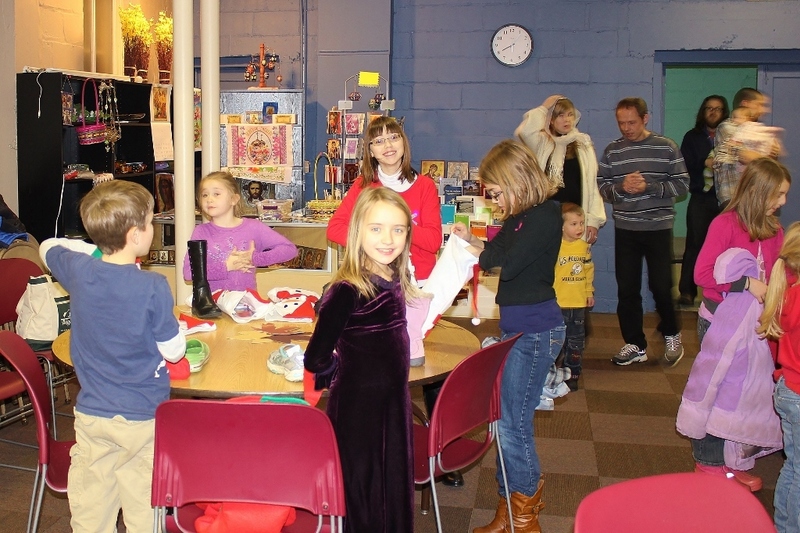 Church School and Adult Bible Study/Religious Education begins at 9 am sharp each Sunday morning with an opening. Fr Paul meets with everybody and gives a short lesson before we break to our classes. 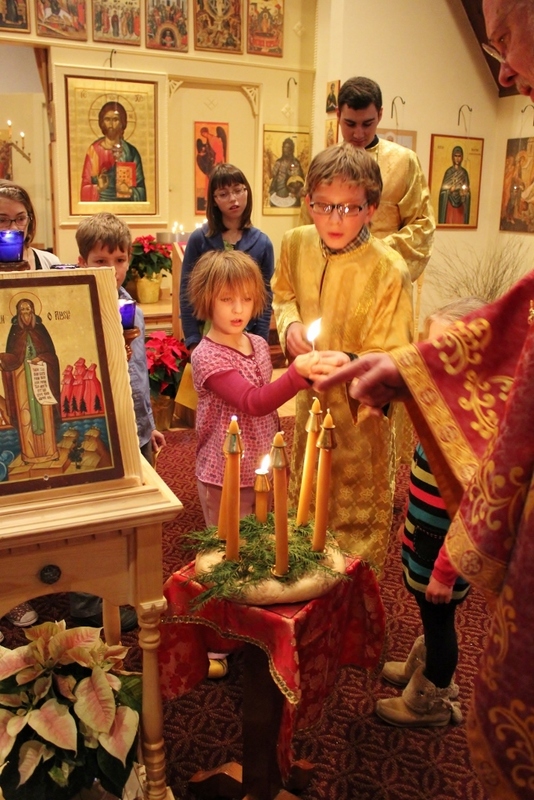 On this particular morning, the children heard the story of a whole bunch of candles that get lit at every Pascha without matches, and without lighters! It happens in Jerusalem. 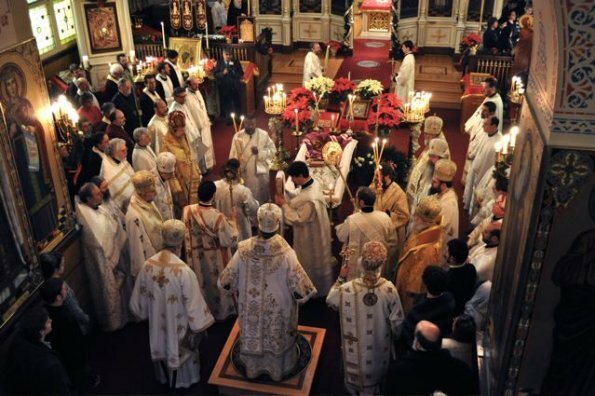 It's called the "Holy Fire" that descends on the candle of the Orthodox Patriarch when he descends into the tomb of Christ on Great and Holy Saturday. He then brings the "Holy Fire" out on his lit candle and spreads it to all the faithful gathered around Christ's Holy Tomb. 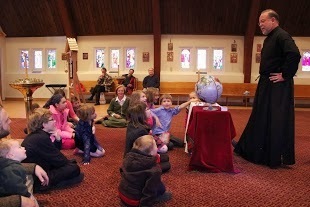 In these pictures, Madeline is finding Jerusalem on the globe. Next, Fr Paul is looking for someone who can find Minneapolis. The Mission - is it possible or impossible? - is this: Tell us how the Orthodox Faith got frrom Jerusalem to Minneapolis. 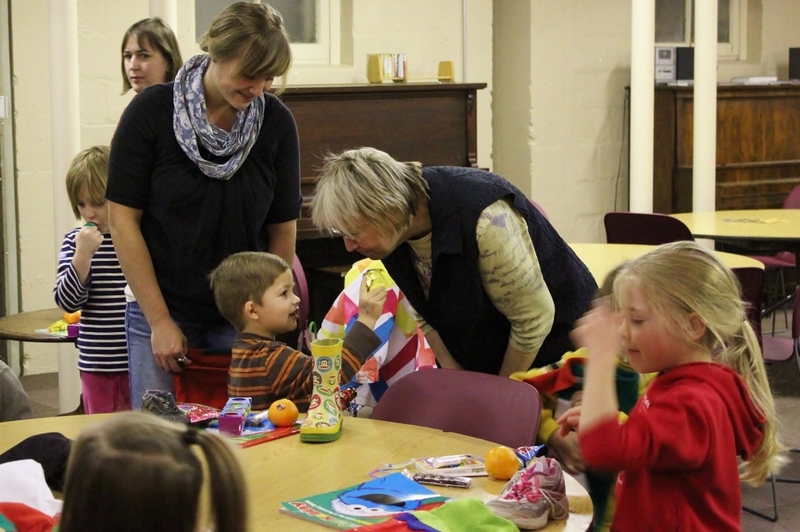 The children are on the case and they'll let us know at a Church School opening very soon! 2013 has been a year full of baptisms and Chrismations! 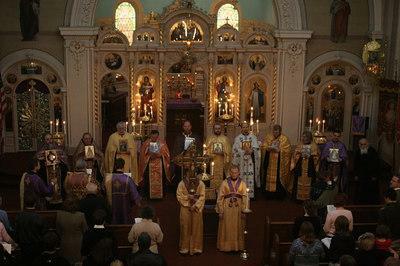 This was our 8th annual pilgrimage to Holy Dormition monastery in Rives Junction, MI. As always, we worked wherever the mothers directed us, to help them prepare for their patronal feast and all the guests they expect on Aug 15. This was a special pilgrimage because we realized that this is most likely the last time we will see Fr Roman before he passes over to the Kingdom of Heaven. 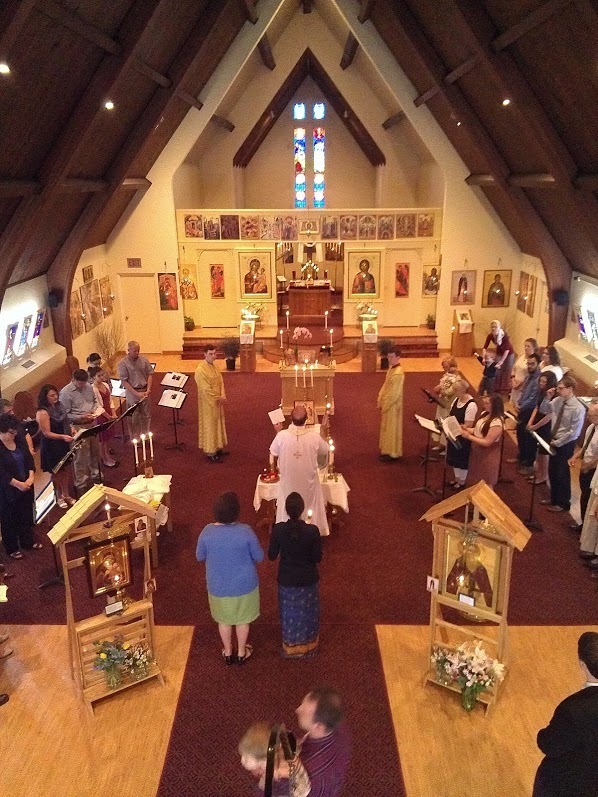 For some of us, this was the first time we got to celebrate the Divine Liturgy in the newly consecrated Katholicon - Monastery Church. And this is the beginning of a new picture-taking tradition. Our group pictures henceforth will be on the steps of the newly consecrated Church. 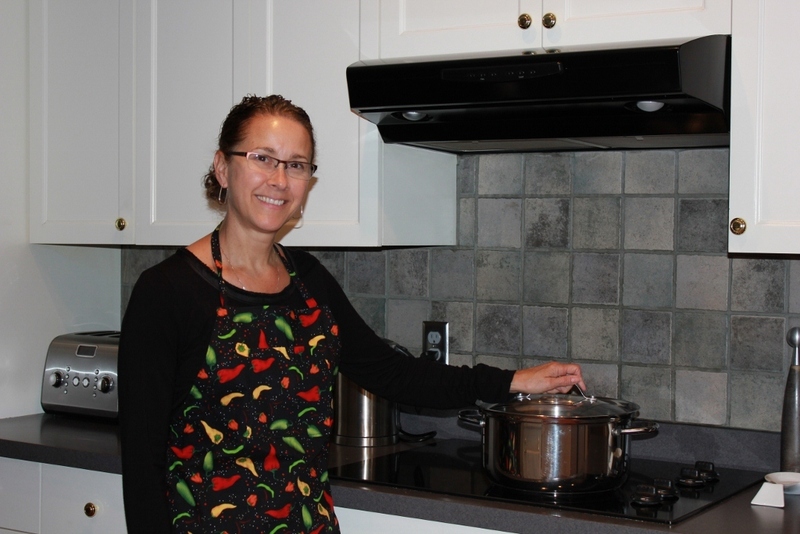 This Year's Wearer of the Apron (WA) is Laurie Rother! That 's short for: Congratulations, 2013 Chili Cook-Off Champion! The origins of the Chili Cook-Off are shrouded in mystery. Some maintain it began in 2001; others think it was maybe 2003. Others, still, think maybe it began in, like, maybe 1899, then went into a kind of hiatus until it was revived at St Herman's sometime towards the end of the 20th or at the beginning of the 21st century. It's been going for a while; and, so far, we have yet to have a repeat champion! 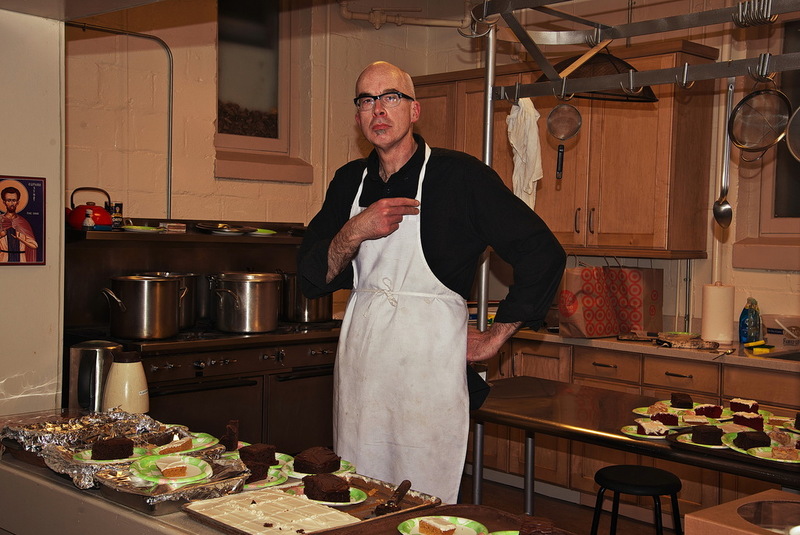 This year's Chili Cook-Off was conducted at the Sunday Coffee Hour on March 3. Competition was stiffly competitive. Eleven entries vied for top honors. But none could unseat our own Laurie Rother. Congratulations to this year's winner of the Chili Cook-Off Apron (WCCA - close to NCAA but there's no basketball! ): Laurie Rother! Wash pinto beans, soak overnight in water to cover. Bring to a boil in soaking water and lower heat. Simmer covered for 3 hours until tender. Drain. melt butter in skillet, add onions, shallots, chiles and garlic. Saute until onion is soft. Add chopped sirloin and cook over moderate heat until meat is brown. In a separate pan, brown sausage, pour off grease and add to meat-onion mixture. Stir flour into meat mixture and blend. Put meat mixture into a pot. Add beans, pimento, tomatoes, celery, mushrooms, sweet and hot peppers, olives, parsley and chili sauce. Bring to a boil, lower heat an simmer uncovered for 30 minutes. Add salt to taste, garlic salt, pepper, coriander, oregano and chili powder. Simmer uncovered for 1 1/4 hours, stirring occasionally. Skim off grease. Before serving remove from heat, stir in sour cream and return to low heat to heat through. 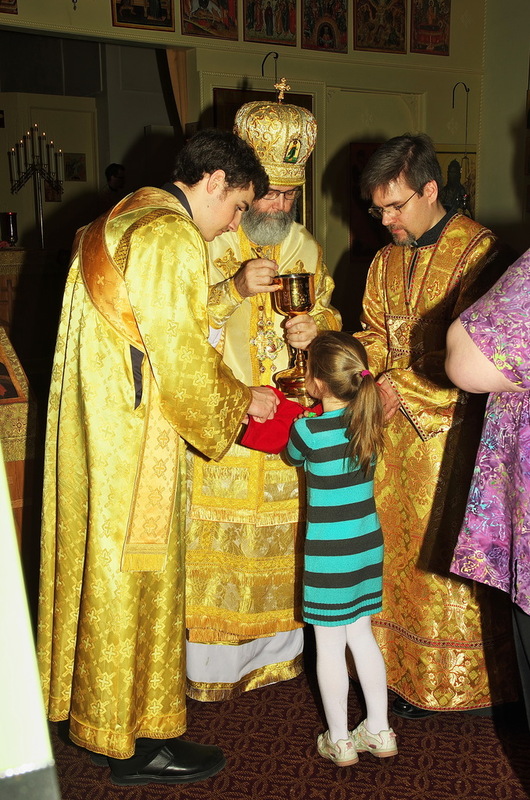 Fr Paul & Presbytera, along with two of their children, Katie and Nicholas, were honored by an invitation from Holy Dormition Monastery to participate in the services for the consecration of their newly built Church. These took place on Friday evening and Saturday morning, Oct 5 & 6. Oct 5, it turns out, was Katie's 18th birthday! Her birthday gift was a an airplane ride from MSP to Lansing, sitting near the front of the plane (with Nicholas and Mom). Fr Paul picked them up at the Lansing airport. He had set out the day before by car and drove through the UP to be at Lansing airport in time to pick them up. They returned to Minneapolis by way of the SS Badger. They spent the night in a couple state rooms on the Badger. 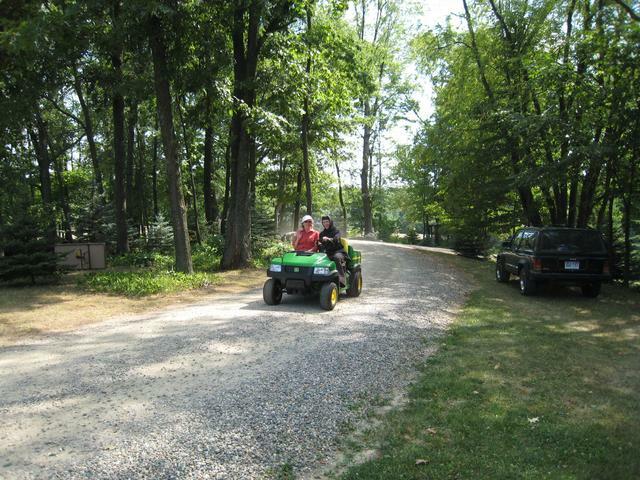 What a way for Katie to celebrate her 18th birthday! The mothers of the monastery made her a cake and sang happy birthday to her, along with some of the guests, on Friday night, after the Friday evening services were over. And a pilgrims' picture gets "tooken"! 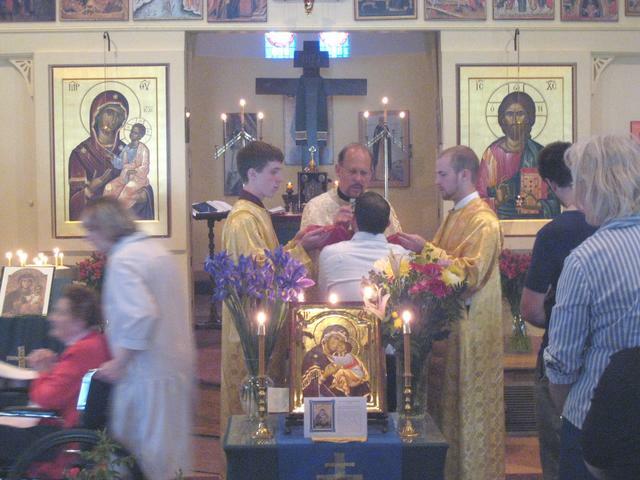 Our 7th pilgrimage to Holy Dormition Monastery in Rives Junction, MI, took place Aug 1 - 3. 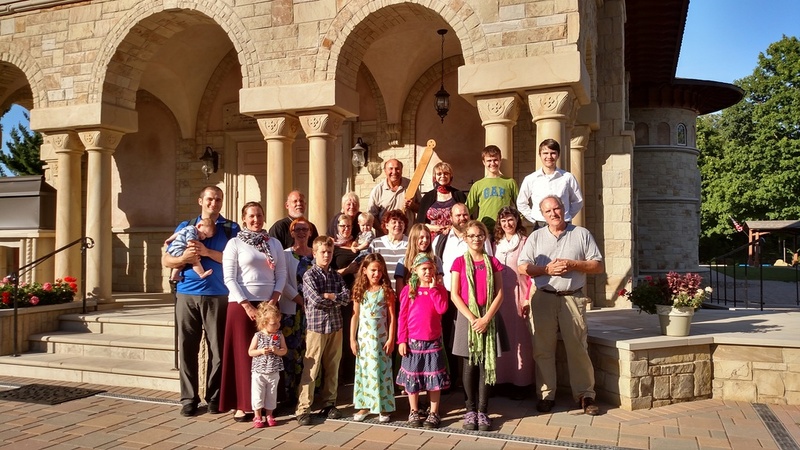 Twenty five faithful became pilgrims for a week, helping the mothers and sisters of the monastery to prepare the grounds and building for their patronal feast on Aug 15, and for the consecration of their new church on Oct 6. Parishioners Nick (Fr Paul's son) and Billie were there for the wedding - and the reception afterwards! 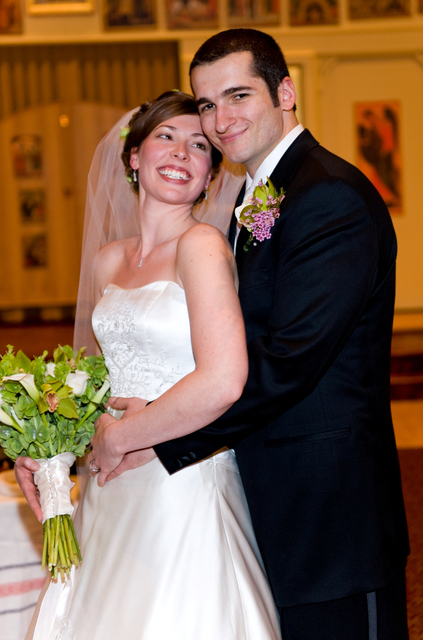 On the last Sunday of June, 2012, St Herman's parishioner, Jonathan, wed his sweetheart, Mary, whose family hails from Vermillion, South Dakota. 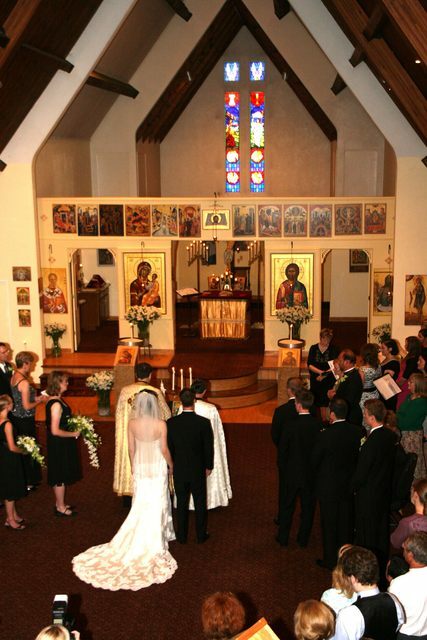 And so, the wedding was performed at Holy Transfiguration Greek Orthodox Church in Sioux Falls, so that Mary's family could be there. 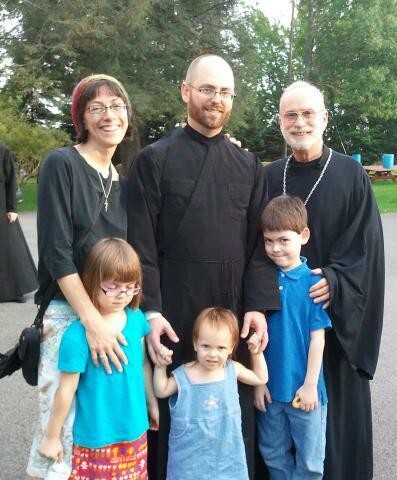 Thank you to Fr Sava and the faithful of Holy Transfiguration for their gracious hospitality! Congratulations to Jonathan and Mary! Graham and Sonia remind Nicholas that they are just a month away from their one year wedding anniversary! After the midnight service celebrating the Holy Resurrection of Christ, we serve Agape Vespers that Sunday afternoon, and we continue to bask in the joy of the Feast. We read the Gospel from St John, recounting the doubt of St Thomas. "That we may be accounted worthy to listen to the Holy Gospel! Peace be unto all!" 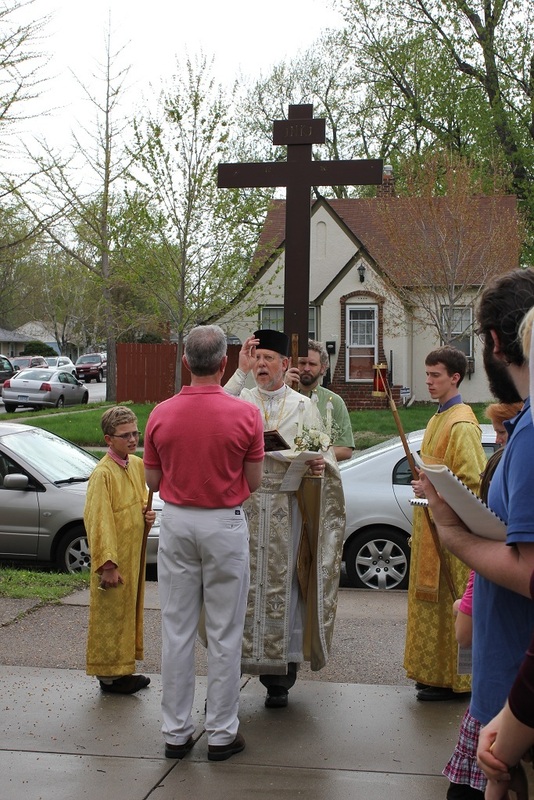 At the end of the Agape Vespers of Pascha Sunday, we make a procession outside around the Church, stopping to proclaim the Gospel of Jesus' Resurrection in different languages; i.e., to all the world. Teresa's husband, Myron, took the pix. Thank you, Myron! The faithful of St Herman's welcomed the Right Reverend Matthias, Bishop of Chicago and the Diocese of the Midwest, to St Herman's on Feb 19. 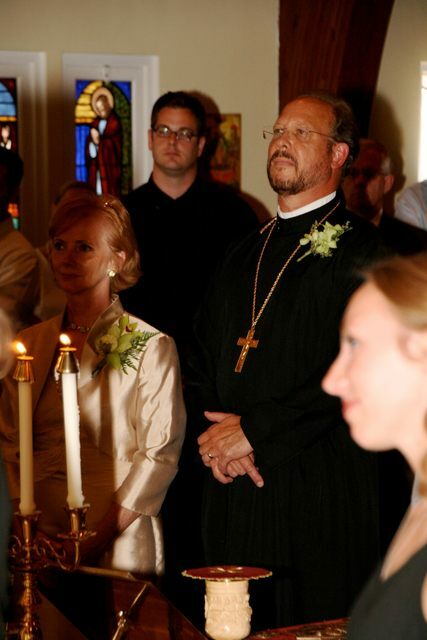 His Grace was consecrated as Bishop of the Diocese of the Midwest in May of 2011. 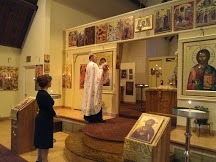 This was his first visit to St Herman's as newly consecrated hierarch. For 10 days over the end of May and the beginning of June, Fr Paul joined three of his brothers - Fr Tom Begley (St George Anticohian), Fr Rick Andrews (St George Greek), Fr Tim Sas (Twelve Apostles in Duluth) - together with Harry Boosalis and Paul Karos on a pilgrimage to Mt Athos. The trip was memorable for many reasons. What made it special was traveling with his brothers, with Harry and with Paul. The pilgrimage began with a flight to Toronto, then to Rome, then to Thessaloniki. There, they venerated the relics of St Gregory Palamas, and enjoyed some chimays (Greek beer) at the waterfront! The next day, they took the bus to the ferry, and the ferry to the Holy Mountain. They were guests at Iveron Monastery. 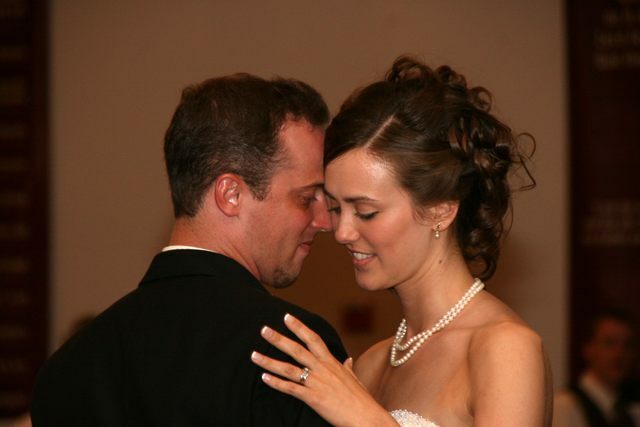 Pardon, but this be Mr and Mrs. Pardun! 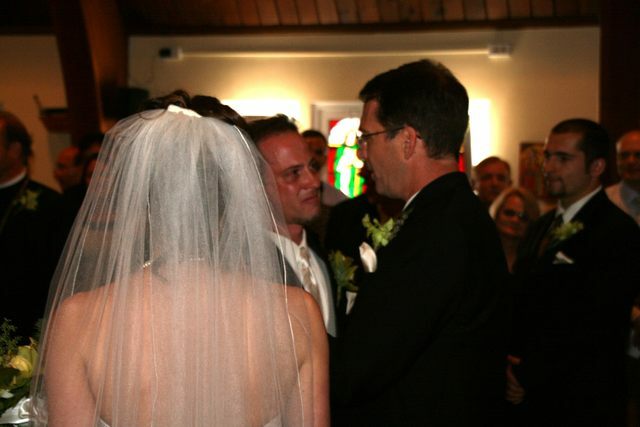 On July 31, Graham Pardun wed his sweetheart, Sonia Wegsheid, which to be sure will go down as the most intelligent thing he ever did in his life. Only a week before, on July 23, Sonia was received into the Orthodox Church through the sacraments of confession and Holy Chrismation. Her sponsor was Emily. Pardon Moi, Too - Good Grief! Another Wedding! The Application has been filled. Mark and his sweetie, Nadia, were married at St Mary's Cathedral on Dec 30 - just in time for Mark to be taken off his parents' taxes as a tax deductible dependent (thanks, Mark!). 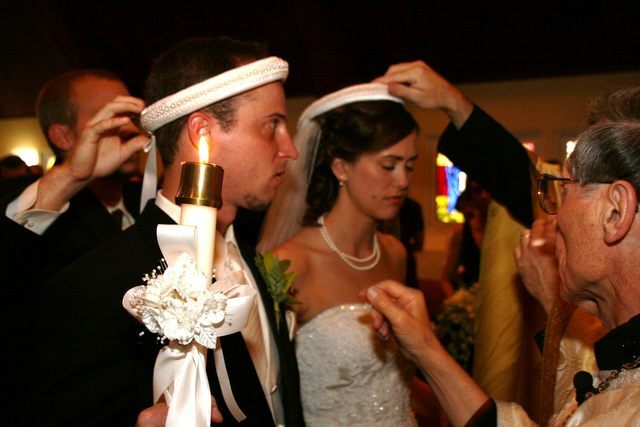 The newlyweds upped and moved to Colorado the day after the wedding, where Nadia is in medical school. Mark is starting his own business. 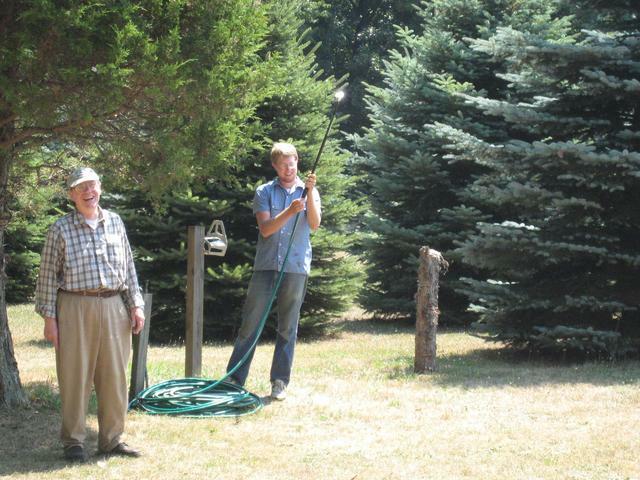 As you can see, my uncles are great squirrel catchers. They're nuts! Off to Denver! They walked! Just kidding! 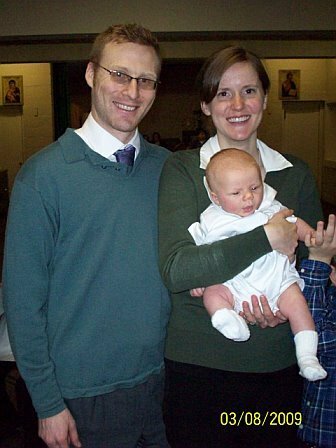 St Herman parishioner, Robert Gauvain, packed his bags this last August of 2010 and moved with his family to Pennsylvania to begin studies as a first year seminary student at St Tikhon's. He is enrolled in the M.Div. program. 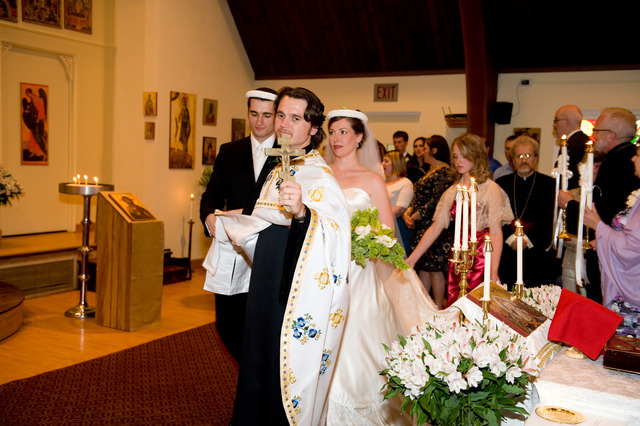 Here, he stands in the cassock he has just been blessed to wear with his wife, Elizabeth, his children, Alexei, Xenia and Vernoica Zoe, and with Fr Nilus of St Tikhon's. 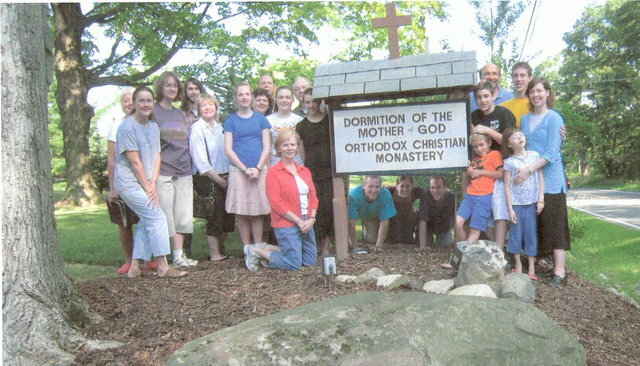 Here are the pilgrims that participated in our 2010 pilgrimage to Holy Dormition Monastery, July 27-29 in Rives Junction, Michigan. There were 24 of us! 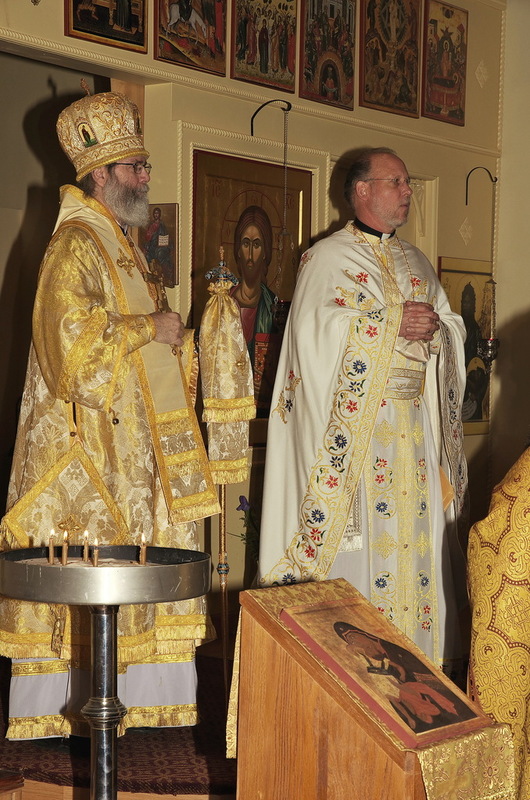 St Herman's was honored and delighted to receive three converts into the Orthodox Church through confession of faith and Chrismation on Lazarus Saturday, March 27, 2010. Giulia was born and baptized in the Catholic Church and wandered through different Protestant and Evangelical groups before finding the Orthodox Church. Her sponsor is Emily Johnson, who was herself received into the Church also through confession and Chrismation only a few years ago. Laura is a convert from the Lutheran tradition. 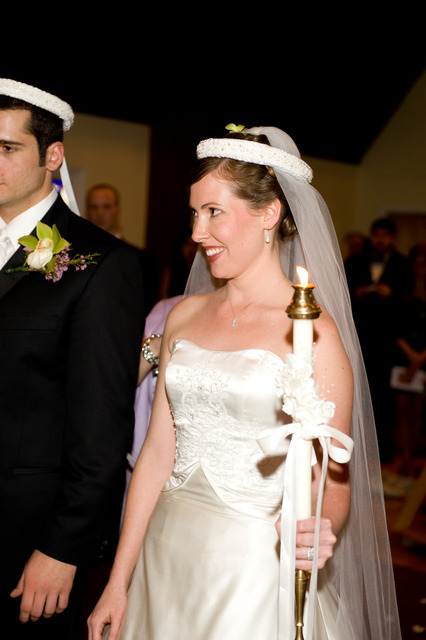 She is engaged to be married to Alex, a parishioner of St Herman's currently serving in Japan in the marines. They plan to be married at St Herman's this July. Her sponsor was Rachel, also a convert. 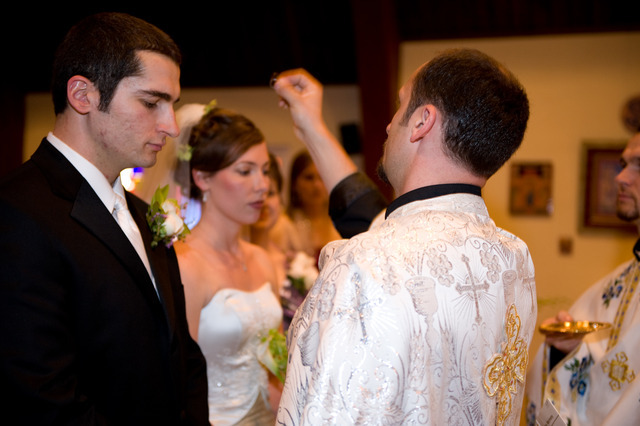 Justin, too, was born and baptized in the Catholic Church and wandered through different Protestant and Evangelical groups before finding the Orthodox Church over a year ago. His sponsor is Brad, also a convert. That's not Grizzly Adams. That's Justin and his sponsor, Brad. It is always a joy to receive more faithful into the Church. Archbishop Job fell asleep in the Lord unexpectedly on Friday, Dec 18, 2009. 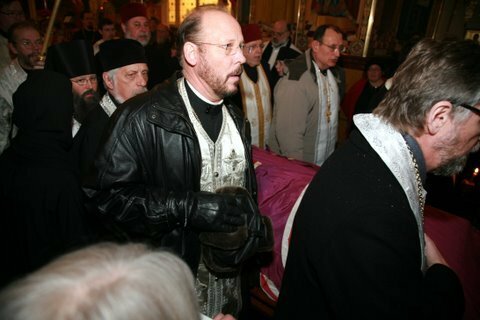 Fr Paul, together with his sons Mark and Nicholas, were able to attend his funeral services at Holy Trinity Cathedral in Chicago on Dec 22 and 23. Archbishop Job's passing is a huge shock. He was very much loved by the faithful and by his pastors. May his memory be eternal. 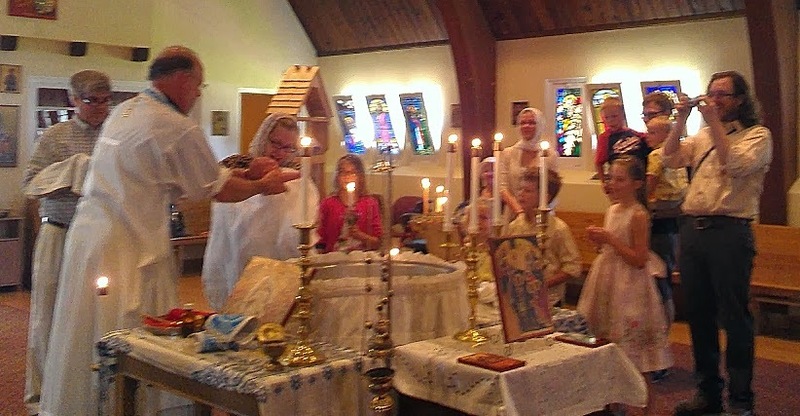 Eighteen parishioners made their way to the Dormition of the Mother of God monastery in Rives Junction, MI for St Herman's fourth annual pilgrimage, July 28-30. 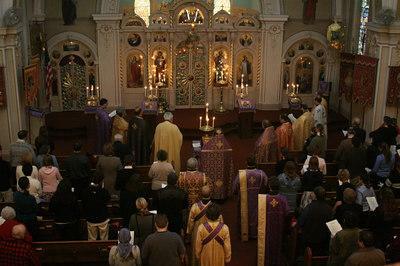 A typical day begins at 5 am with Matins and the hours, followed by Typica or Divine Liturgy. 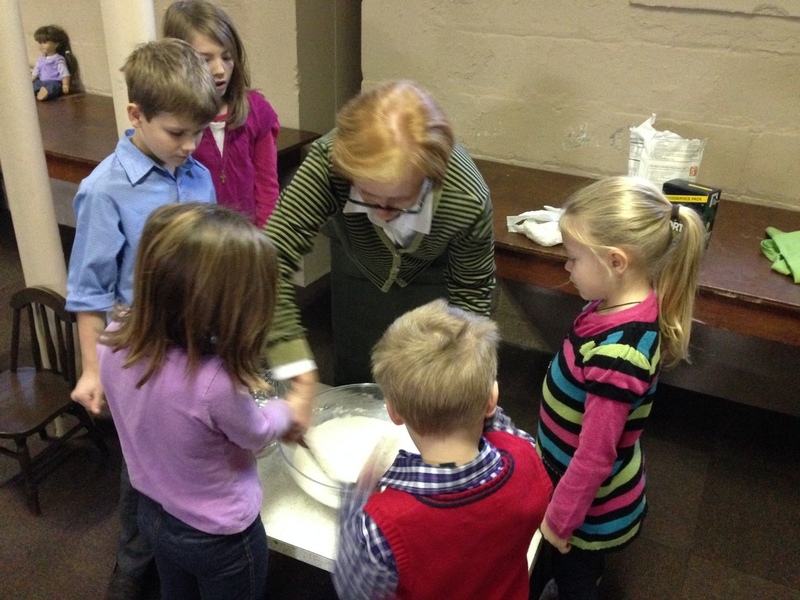 After breakfast with the mothers and sisters, we tackle whatever jobs Mother Abbess Gabriella gives to us. We break for lunch, then we go back to work until Vespers at 5 pm. 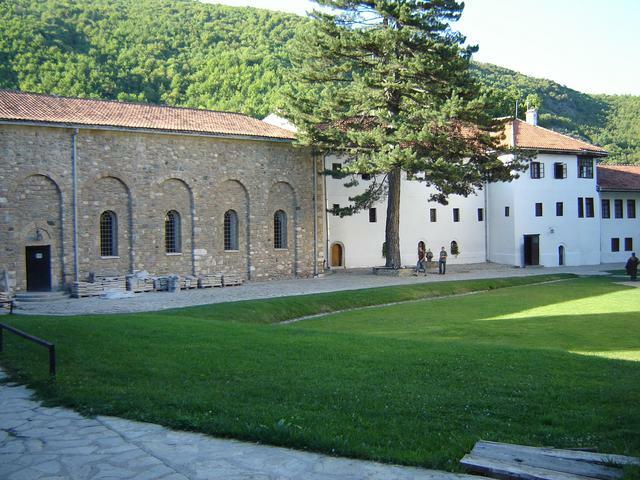 Dinner follows Vespers and the evening is free to collapse in our guest rooms, or to stroll the beautiful monastery gorunds, or to sit outside and enjoy friendly conversation. And the men worked hard to keep the trailer from blowing away in the breeze. Groom's Parents, Fr Paul & Presbytera. 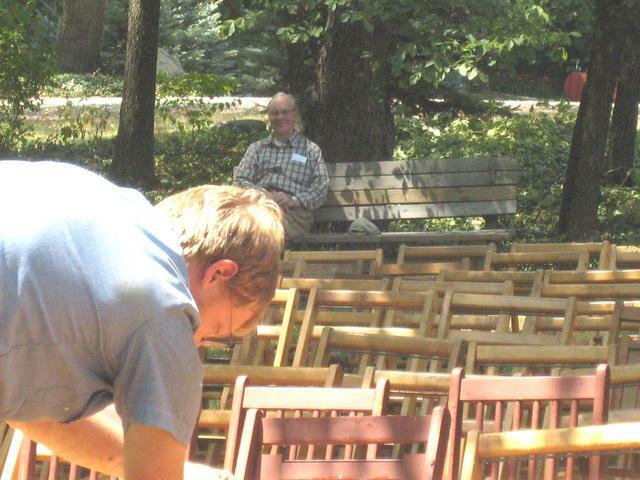 After the weddings of two of his five kids in one summer, Fr Paul was asked if he was all "weddinged out"? "No, I'd actually like to see at least a couple more!" he replied. 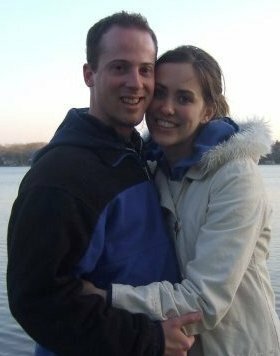 The engagement of Sean Wesche and Rachel Johnson (scroll down and you can read about their engagement here!) 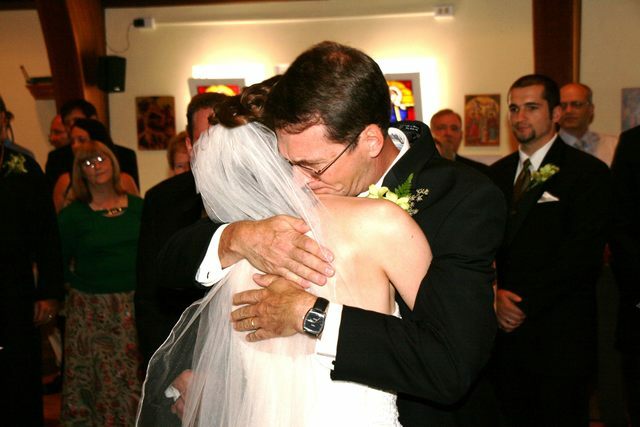 came to a very joyous end on Sunday, July 26, 2009, when the two lovebirds were married at St Herman's at 330 in the afternoon. 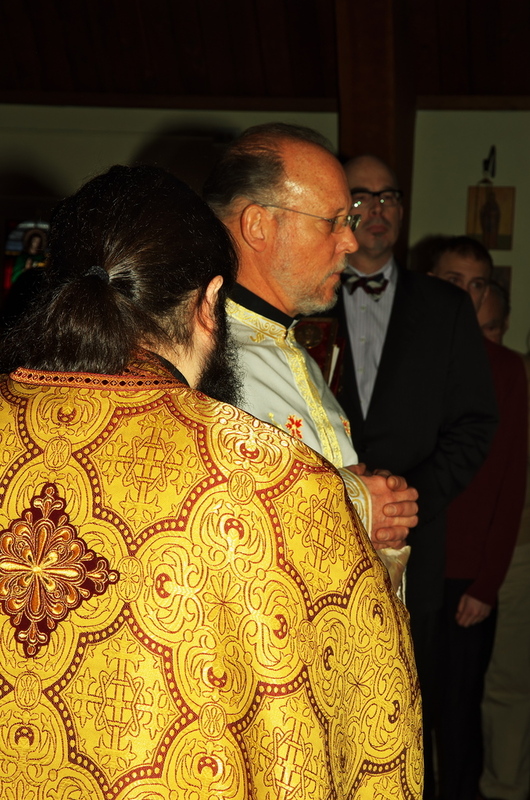 Fr Brian Andrew Jaye, pastor of Christ the Savior Orthodox Church in Anoka, and Fr Vladimir Lecko (attached to St Herman's) officiated. Trying to look happy....and succeeding rather well! Suddenly, everything's turning up rose petals! 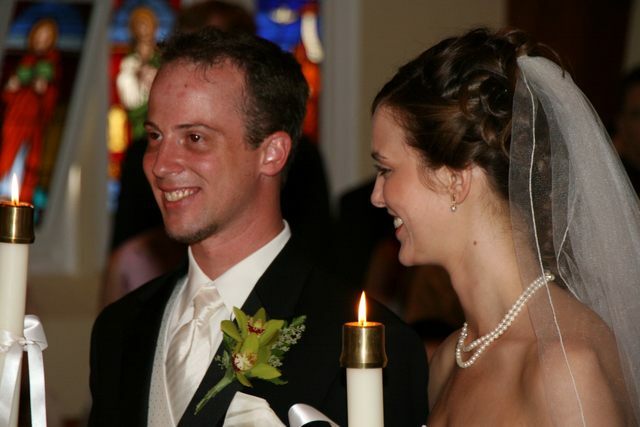 Inspired by the inspiring romances of his older brother and older sister (Christina was wed on May 24 - scroll down and read all about it! ), Mark is re-thinking romance and is now accepting applications for any unattached female romantics. Any gorgeous female interested may submit her application to his mother! St Herman's sent eight of its finest young people to St Mary's Summer Church Camp at Lake Wapogasset in Amery, Wi this summer, and they had a great time. Nick the older and his brothers Mark and Sean, together with Lizzie were counselors. Nick the younger, together with Alexa, Katie and our own Romanian Princess Alena Gabriella were campers. 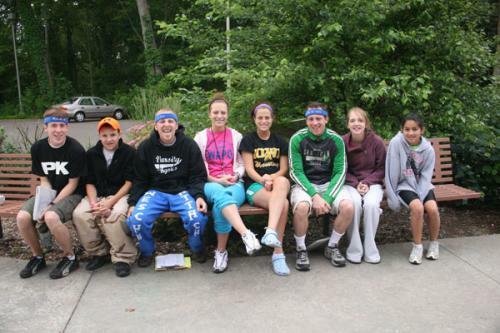 No doubt, the presence of these fine young people is a huge reason why this year's summer camp was such a success! Will they go again next summer? You betcha! 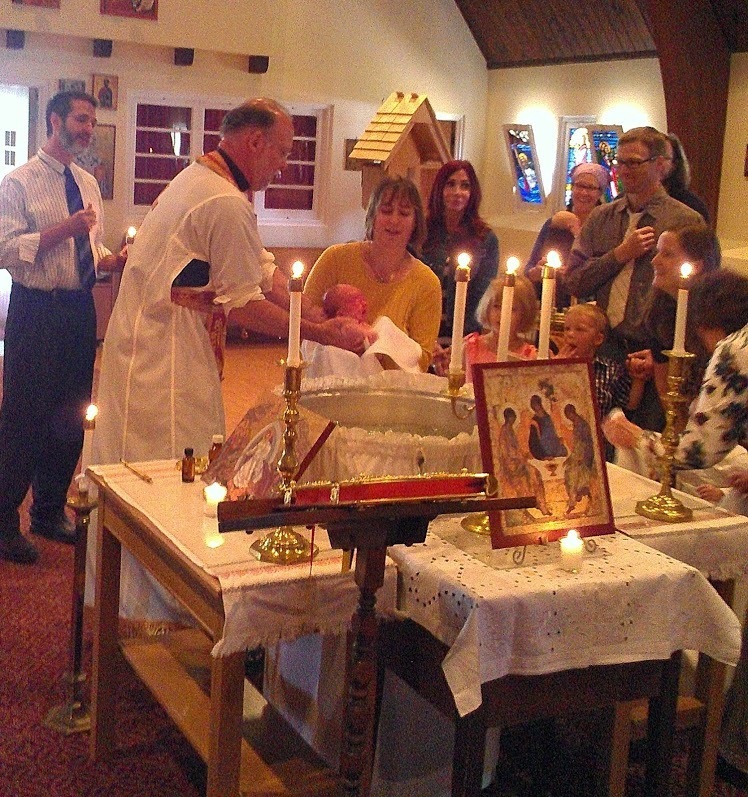 St Herman's faithful were honored to participate in the baptism of Natalie Mary, the daughter of Richard and Svetlena Jones, on Sunday, May 31, during the Divine Liturgy. Congratulations to the godparents, Matthew and Becca, to the grandparents and to all the family and friends of Natalie. 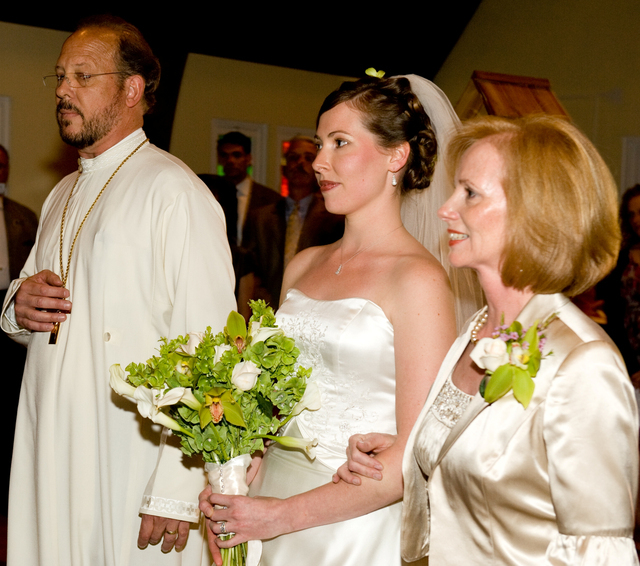 On May 24, 2009, Christina Michelle Wesche, the daughter of Fr Paul & Presbytera Nancy Wesche, was married to Mr. Emanuel Olimpiu Sas, the son of Fr Aurel and Presbytera Lidia Sas. 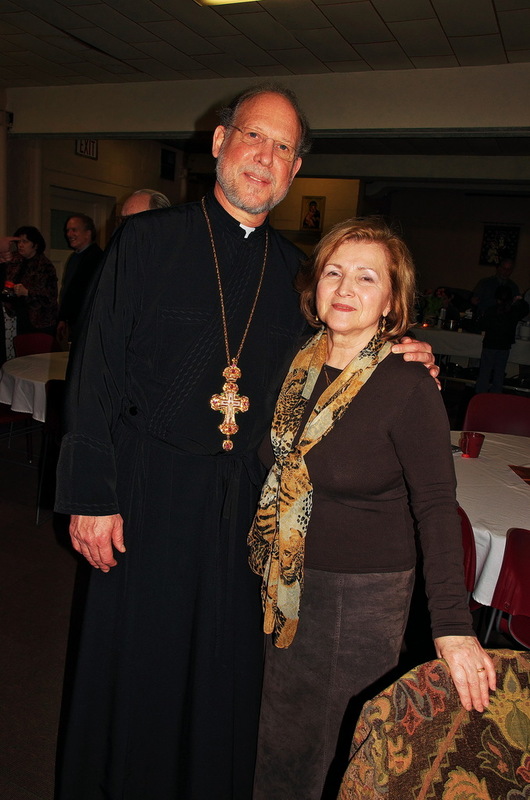 Fr Aurel and Lidia serve a Romanian Orthodox parish in Las Vegas, NV. Two of Emanuel's three brothers are also priest. 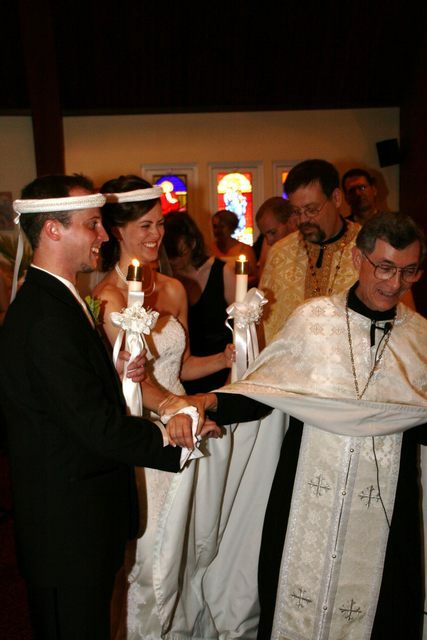 Fr Tim, who serves a Greek Orthodox parish in Duluth, MN, and Fr Cyprian, who serves a Greek Orthodox parish in Cedar Rapids, IA, served the wedding along with Fr Vladimir Lecko, a close friend of the Wesche family, and a kind of adopted grandfather to the Wesche kids. 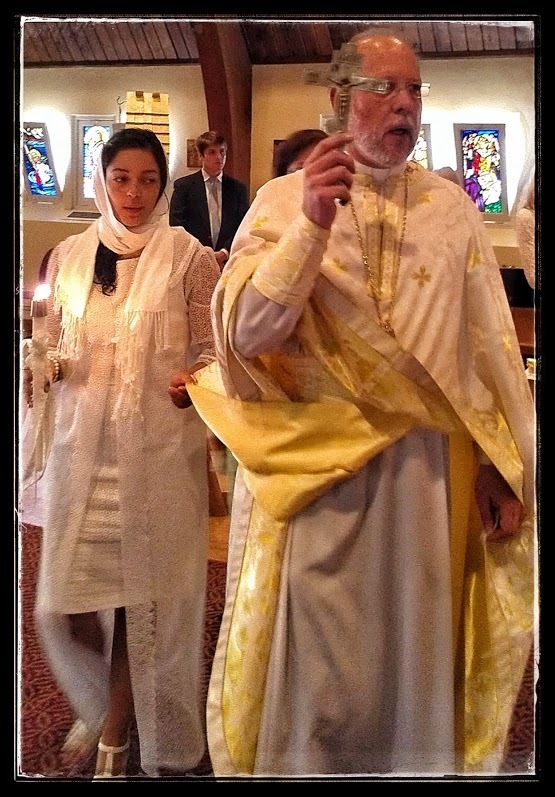 Fr Jonathan and Presbytera Vera Proctor (they serve Holy Trinity Orthodox parish (OCA) in St Paul, MN) were the godparents for the bridal couple. A special dignity adheres to the children of priests, and so this was a royal wedding of Princess Christina to her Prince Emanuel. O Lord, crown them with glory and honor! 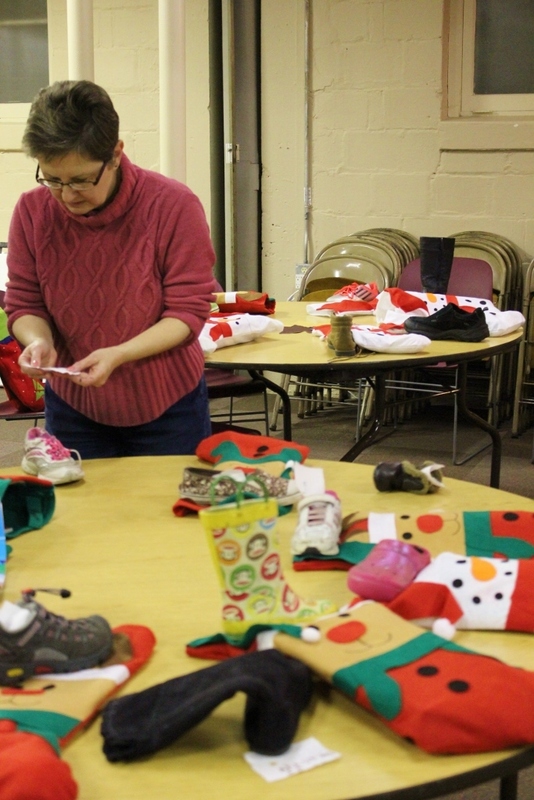 The beginning of the "Martyrs' Joy"! The wedding cake was delicious! 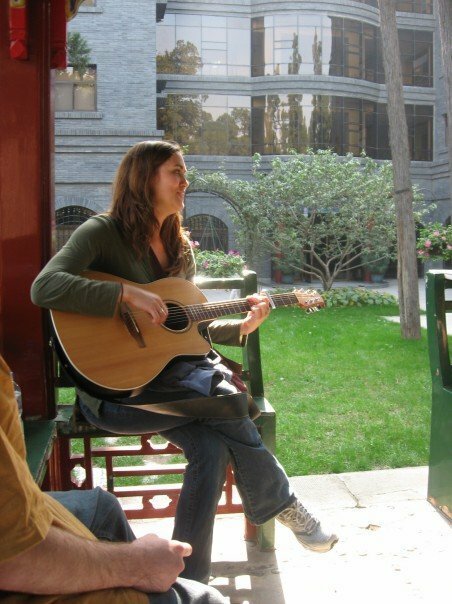 Rachel could sing off key (not that she ever would) and her voice would still be music to Sean's ears! 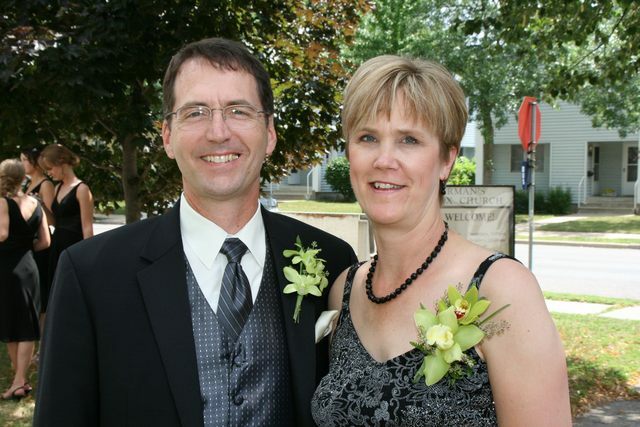 Fr Paul and Presbytera Nancy have two children who are planning to be married this summer. A few months after their daughter, Christina, was engaged to Mr Emanuel Sas (scroll down to find the announcement of Christina's engagement), their eldest son, Sean Michael, became engaged to a certain Rachel Johnson. They met at St Herman's. Sean did a double-take and fell in love with her on the second take. Rachel demurely concedes that Sean fell in love with her on the first take. To understand the full significance of this, it must be pointed out that Emanuel determined Christina was his God-given bride when he heard her chanting the Scriptures at a Great Vespers service. It would appear that St Herman has suddenly become a holy match-maker. Young unmarrieds - enter St Herman's with caution! 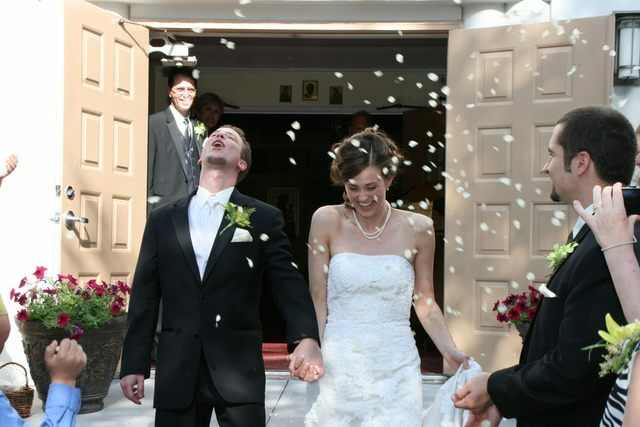 Sean and Rachel are planning a Sunday, July 26 wedding at 4 pm at St Herman's. 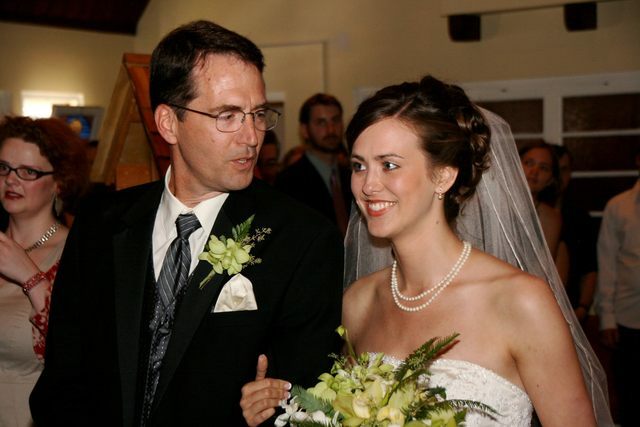 (Both Sean and Christina have firmly resisted their father's suggestion that they elope!) 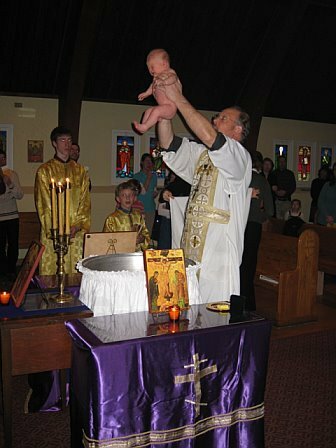 Fr Andrew Jaye will perform the sacrament - if, that is, the FBI doesn't catch up with him first. Two weddings in one summer! 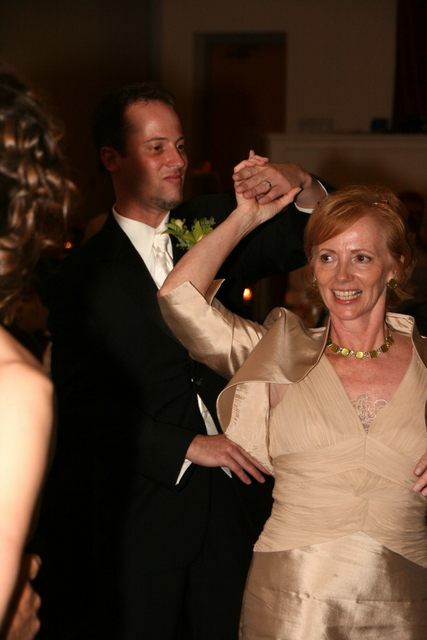 Mom is ecstatic; Dad can hardly wait to get everyone out of the house! Parish Council Presidente, Gene Rebeck greets Archbishop Job on Sunday morning. "Know you are among faithful who love you," he said to His Eminence. Acolyte, Nick Rolston, held the Prayer Book for His Eminence so he could read the prayers during the "Liturgy of the Word." 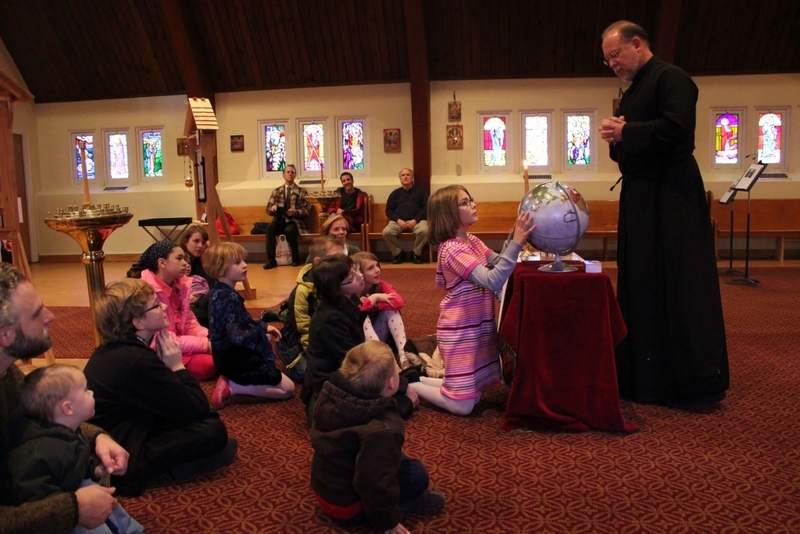 Archbishop Job paid an Archpastoral visit to St Herman's on March 14 & 15. The specific purpose of his visit was to bestow on Fr Paul the blessing of the Holy Synod to wear the "Palitza", a diamond shaped piece of brocade that hangs from the hip. It symbolizes the sword of the Spirit, which is the Word of God, and also the towle with which the Lord girded himself to wash the disciples feet. According to the Service Book, it is typical of profound zeal for the faith and the salvation of Christ's flock. Archbishop Job encouraged the faithful of St Herman's by saying that such an award reflects on them as much as it does on the priest. Indeed, it reflects on the whole deanery, and even on the bishop, since we are all engaged in the one common work of proclaiming the Gospel to the world. 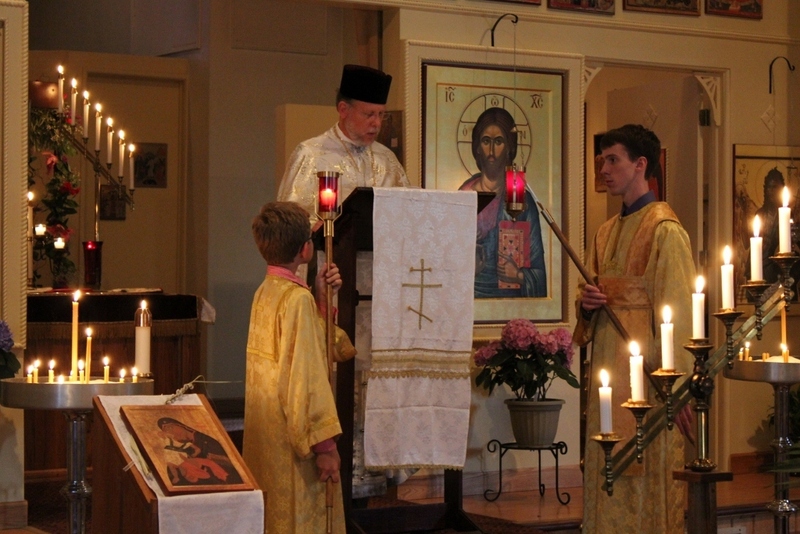 Archbishop Job took occasion also to bestow on acolytes Nicholas Wesche and Caleb Tkach the blessing to wear the orarion in the Diocese of the Midwest. In general, twould seem that the faithful were somewhat pleased to welcome Archbishop Job to St Herman's. 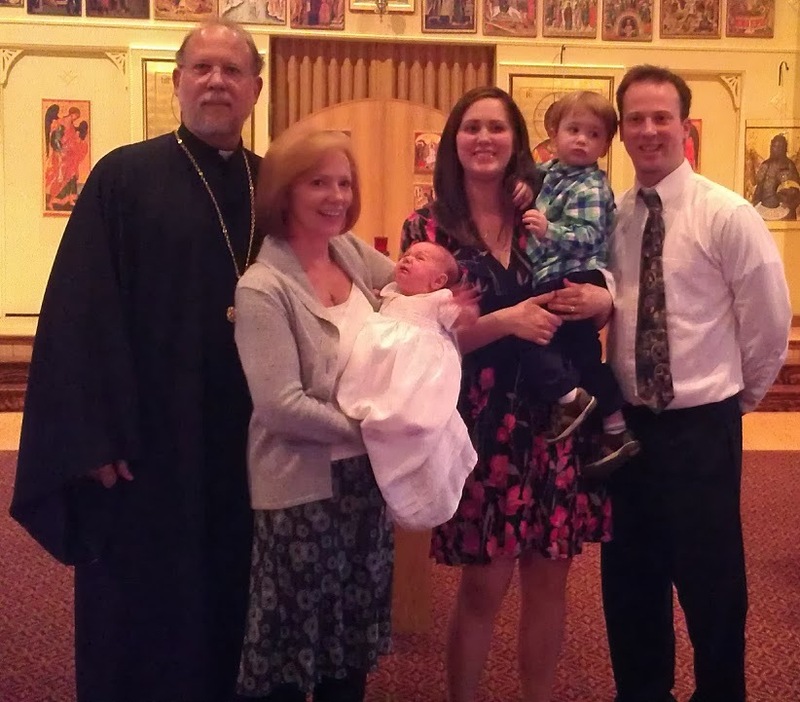 Congratulations to Becca and Matthew (and Grandma Laura) on the baptism and chrismation of their first-born son, Aidric Daniel, on Sunday, March 8, during the Divine Liturgy of St Basil. It was also the First Sunday of Great Lent. 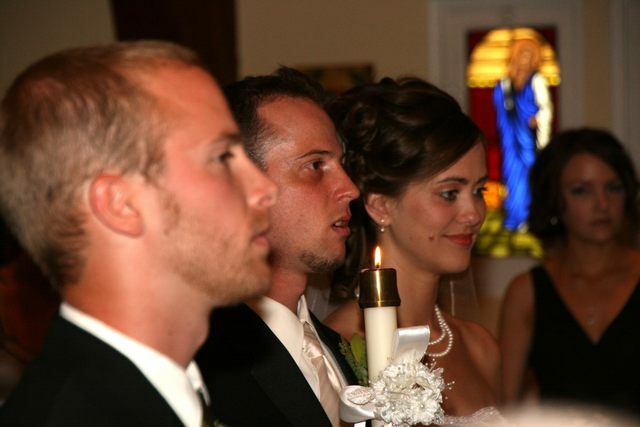 Sean Wesche and Rachel Johnson (who are planning a July wedding of their own) were the proud godparents. 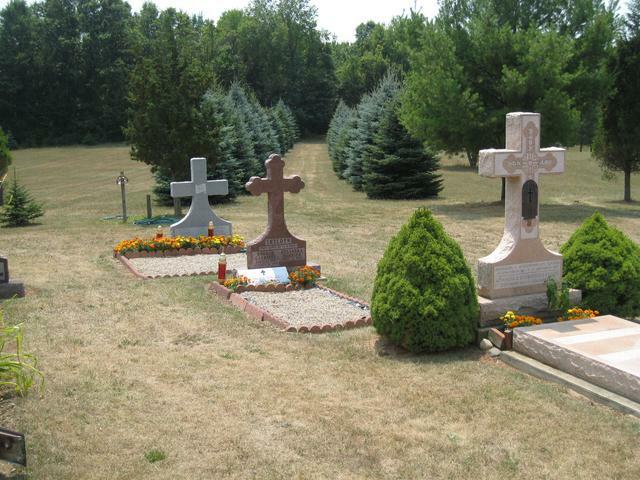 Tuesday through Thursday, July 29 - 31, were the days of our 2008 pilgrimage to Holy Dormition Monastery in Rives Junction, MI. Can you find all 21 pilgrims in the picture at right? St Herman's enjoyed another Great American Picnic on Saturday, July 12. Presbytera prepared her delicious chicken dinner. There were delicious pies for dessert; even games for the kids. The chicken dinner was unbelievably delicious. People couldn't believe it. And there was a barbershop quartet of four exceptionally handsome and cool dudes: Sean, Nicholas, Mark and Joshua. St Herman's Barbershop Quartet crooned and the ladies swooned. Christina swooned to the tune, I Love You Truly, thinking of her beau, Emanuel. 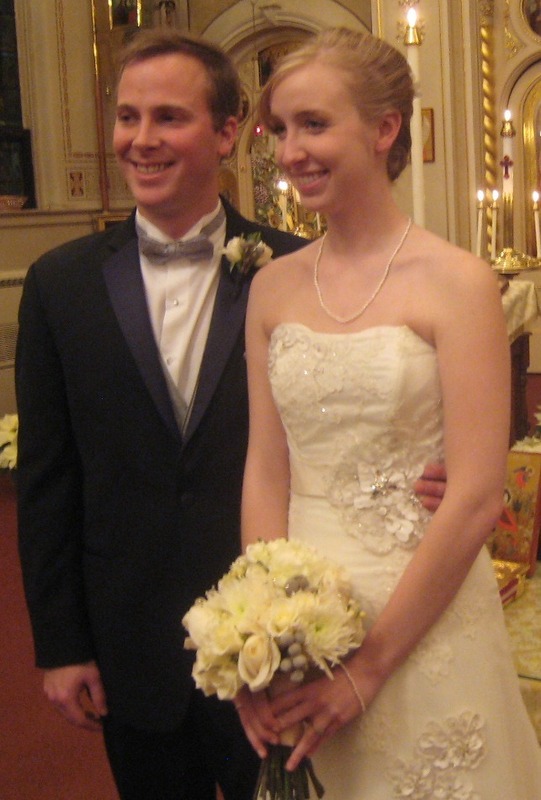 Christina, daughter of Fr Paul & Presbytera, was officially engaged to Emanuel Sas on Thursday, June 26. 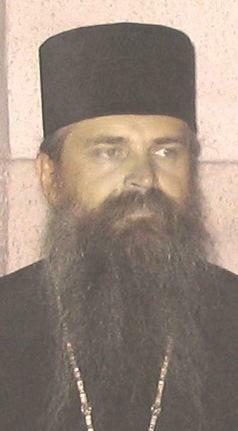 Emanuel is the son of Fr Aurel and Presbytera Lydia Sas, priest and presbytera of the Romanian Orthodox Church in Las Vegas. 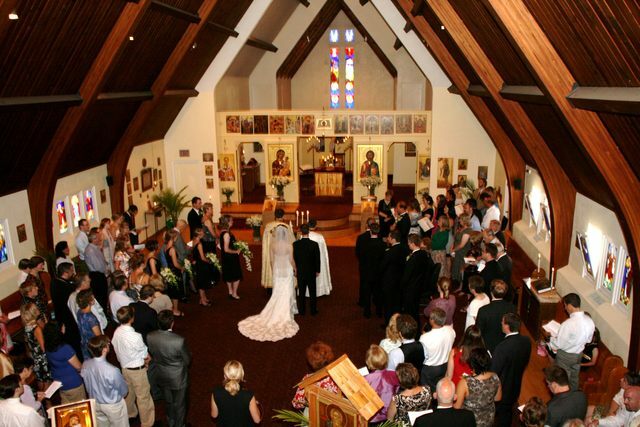 Christina and Emanuel are planning a wedding at St Herman's on Sunday, May 24, at 4 pm. The Very Rev Fr Vladimir Lecko will perform the sacrament. On Sunday, June 22, the faithful of St Herman's had the joy of receiving Rachel Johnson into the fullness of the Church through the sacraments of confession, Holy Chrismation and Holy Eucharist. Rachel is Emily's sister, who was received through Chrismation last year near the Feast of Holy Dormition. Rachel took for her patron saint the Samaritan woman who, in the Christian Tradition, is known as Photine (Enlightened One). One of these guys is doin' his own thing. Two of these guys are kinda the same. First, we had to pick a Nick. Nick picked Nick and Nick picked Nick. Once the picked-Nick was Marked, the pic-a-Nick could begin. The Pic-A-Nick was a celebration to celebrate the end of another great year of Church School and Adult Education. People learned so very many things. They need the summer to digest everything so they can be ready to begin again in the Fall. The picnic, or rather Pic-A-Nick, took place at Minnehaha Falls, not far from the Church. Great Lent was rich in spiritual blessings this year. 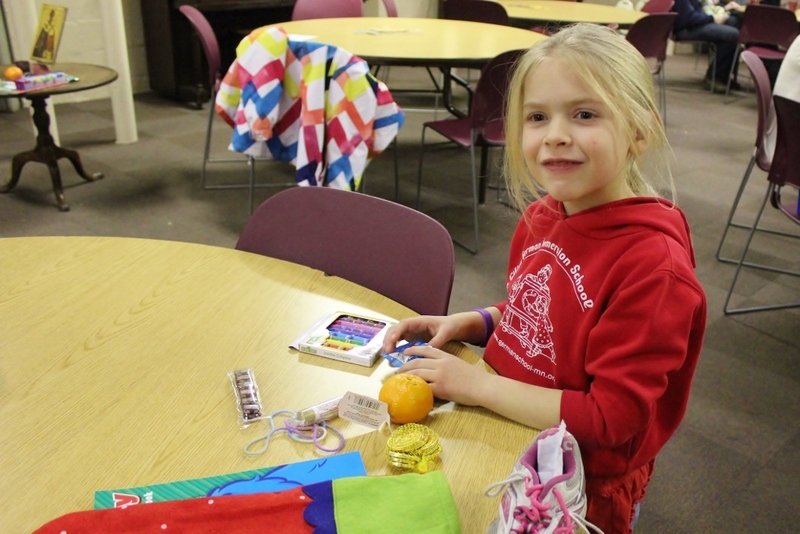 Great Lent began with a Lenten retreat, hosted by St Herman's and Christ the Savior Orthodox Mission Parish in Anoka on Saturday, March 15. The guest speaker was Fr Jonah Paffhausen, abbot of St John Monastery (OCA) in Manton, California. Fr Jonah addressed the participants on Orthodox evangelism or missions. An Orthodox community is established in the Spirit of Christ as the faithful support each other on the inner journey of repentance, each one of the faithful working to root out of oneself all those angers and fears that rob one of love for God and neighbor. Orthodox Evangelism is rooted in the experience of divine forgiveness and the ability through the grace of God to forgive others. By confronting one's own sins and overcoming them in the grace of Christ, one begins to radiate the love of God, which is what draws people who are seeking genuineness and love. This is the heart of Orthodox evangelism. 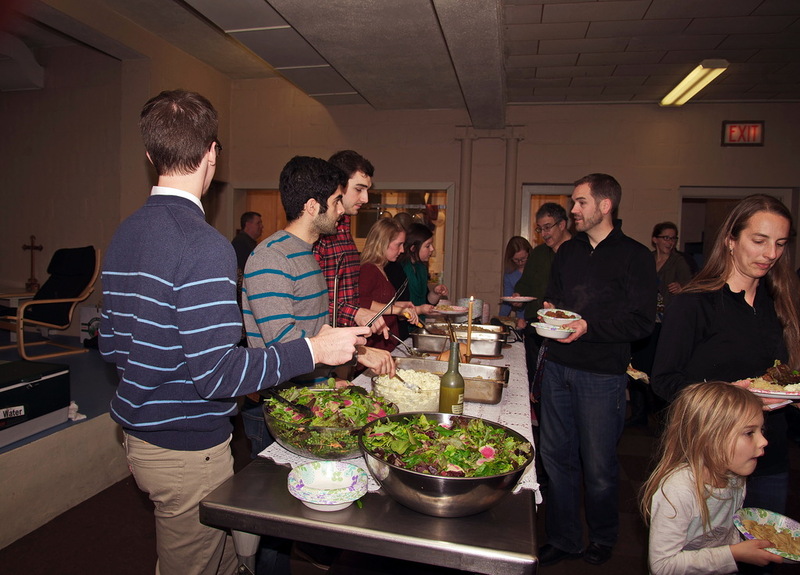 The day after the Lenten retreat led by Fr Jonah was the first Sunday of Great Lent. 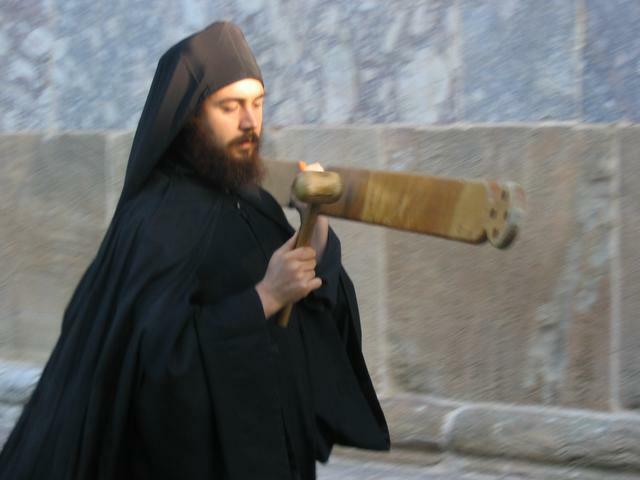 This is called the Sunday of Orthodoxy. On this Sunday, the faithful commemorate the restoration of holy icons in the worship of the Church by the holy fathers of the Seventh Ecumenical Council in 787, and again in 841. 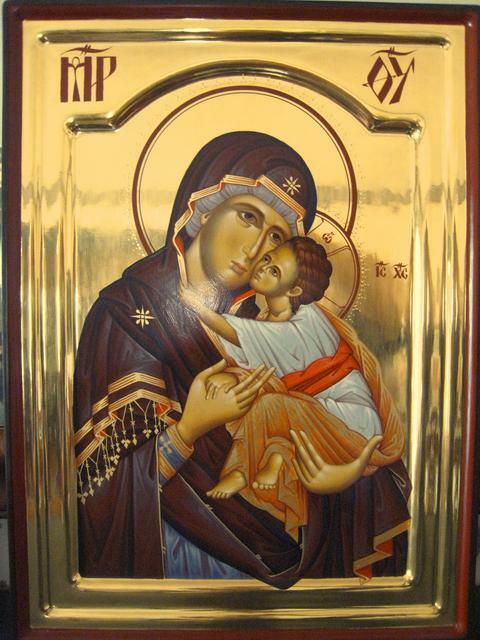 The icon is a form of religious art that follows strict canons so that it is historically and theologically faithful to its holy subjects: Christ, the Theotokos (Mother of God or the Blessed Virgin Mary) and the saints, in whom God rests. The holy fathers of the Seventh Ecumenical Council called holy icons "mirrors," suggesting that they reflect the spiritual realities of the "Kingdom of Heaven within you." 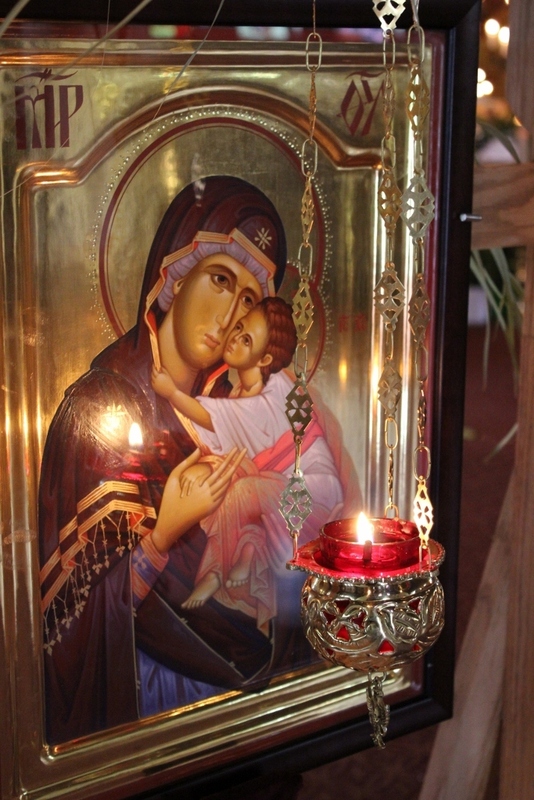 The icon is critical to Orthodox worship and theology because it affirms the reality of the Incarnation. Those who deny the veneration of icons in effect deny the Incarnation of God the Word. 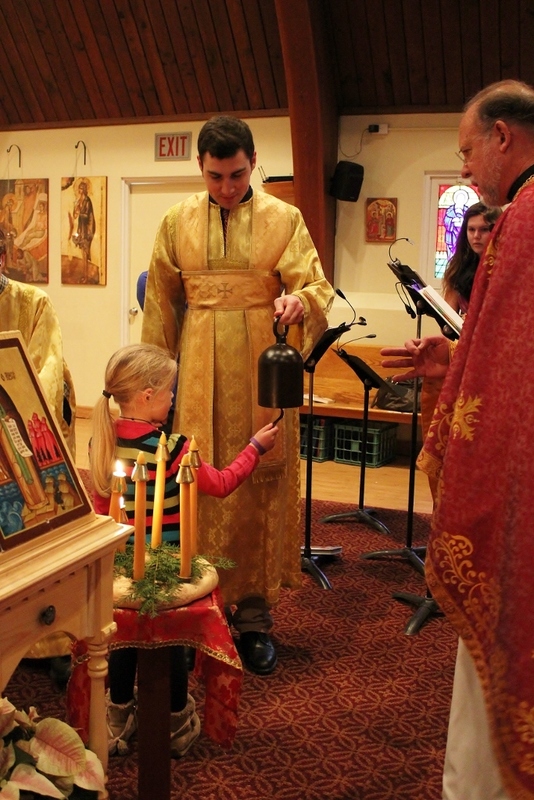 Traditionally, the Orthodox parishes throughout the Twin Cities area come to St Mary's Cathedral in NE Minneapolis to celebrate Orthodoxy Sunday together at the service of Lenten Vespers. Fr Jonah Paffhausen was the guest homilist. 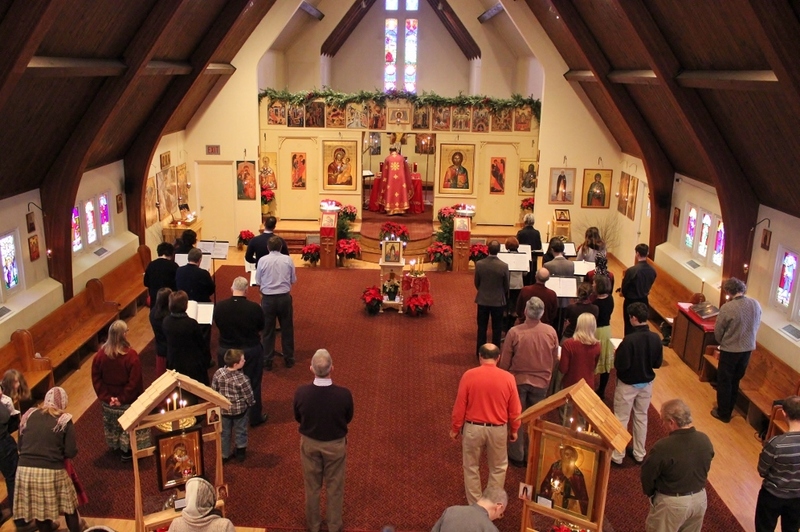 On the weekend of the Veneration of the Cross, St Herman's hosted a Lenten Retreat, led by Mother Gabriella, Abbess of Holy Dormition Monastery in Rives Junction, MI. Mother Gabriella addressed us on the topic: "Healing Us of Our Passions by Thy Passion, O Christ Our Savior." Mother Gabriella was with us the next morning also for the Divine Liturgy and for the reception into the Orthodox Faith of Darren and Jessica. Her presence with us was like a lliving icon of the Holy Mother and added richly to the spiritual beauty of the services. On the Third Sunday of Great Lent, the Sunday of the Veneration of the Cross, we were blessed to receive Darren and Jessica into the Church through Baptism and Chrismation. 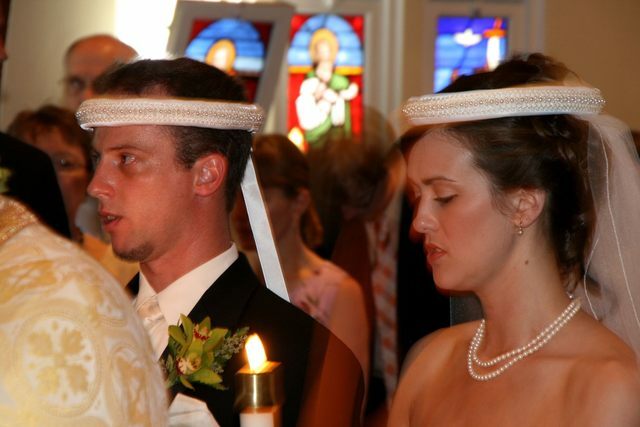 Darren was baptized and chrismated; Jessica was chrismated. 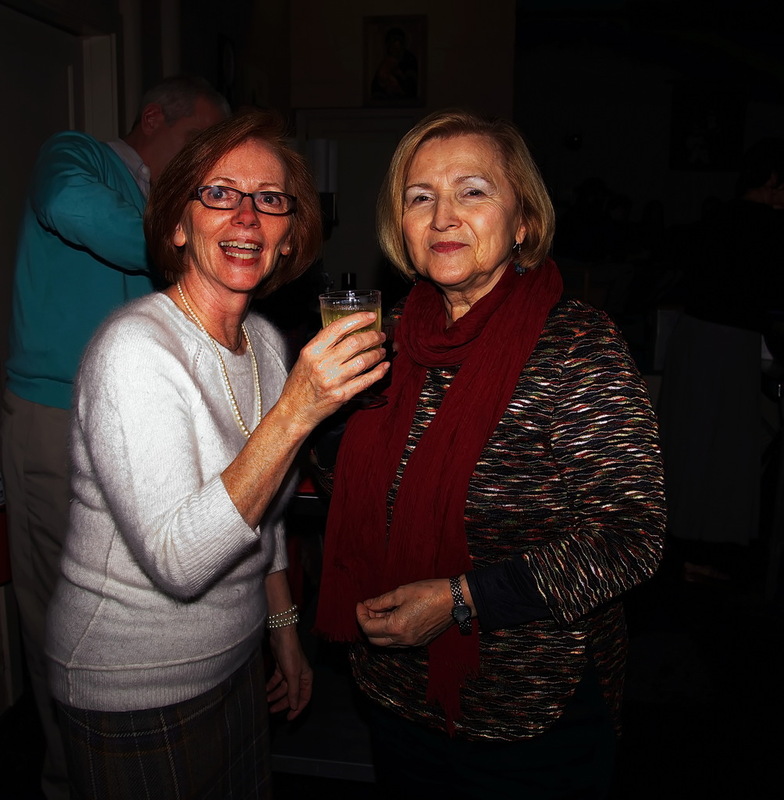 Mother Gabriella, Abbess of Holy Dormition Monastery, was present as well. The beauty of the service can only be described as heavenly. Congratulations to Darren and Jessica! 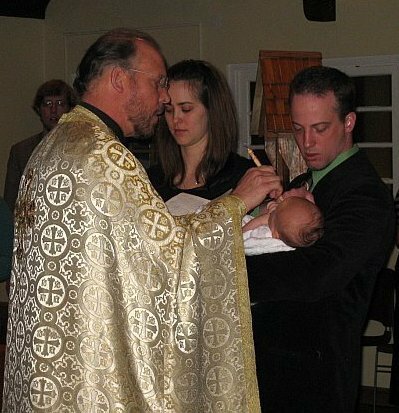 Two weeks after the Lenten Retreat led by Mother Gabriella and the reception of Darren and Jessica into the Orthodox Faith, we baptized and chrismated the new-born daughter of Robert and Elizabeth Gauvain on the Sunday of St Mary of Egypt, the Fifth Sunday of Great Lent. Their daughter's name is Veronike Zoe. 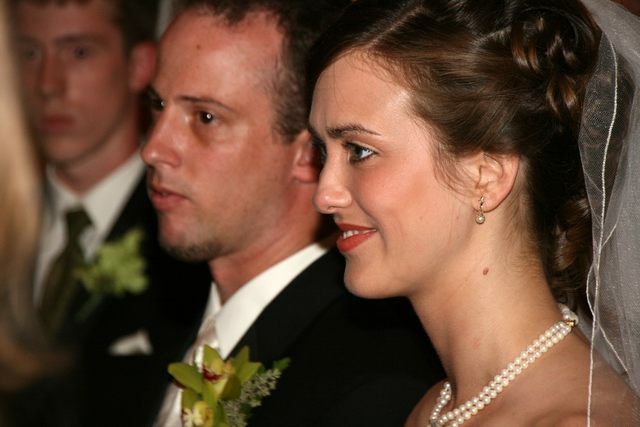 Her godmother is Malene (Elizabeth) Ford, who is herself expecting her second child in late June! The tonsuring. (It's hard to tonsure a cue-ball with no hair!) Mom looks on proudly. 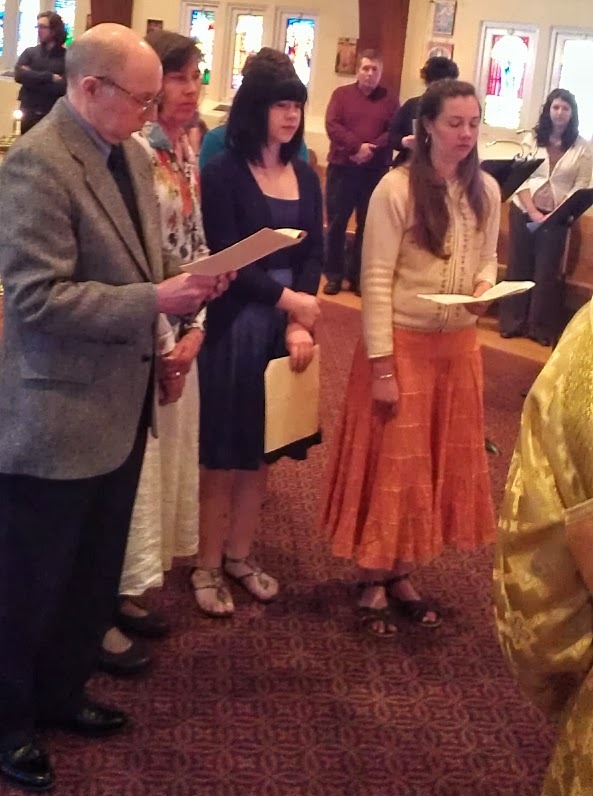 On Lazarus Saturday, April 19, we received four more catechumens into the Orthodox Faith. 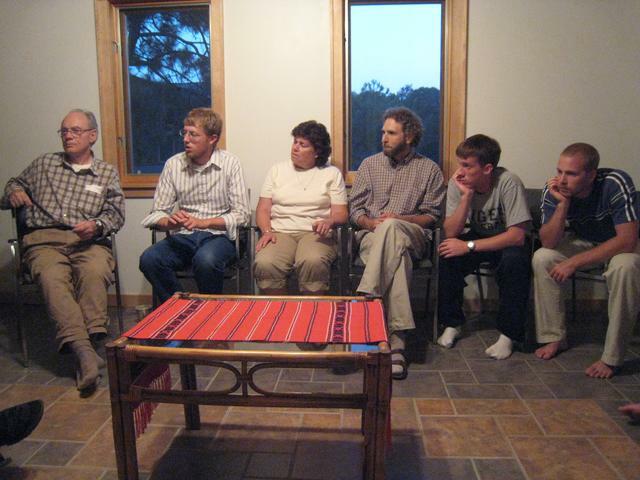 Joe, Matthew and Becca, and Jonathan were received through confession of faith and Holy Chrismation. Joe's chrismated name is Joseph the Betrothed (husband of the Blessed Virgin); Matthew's is Bartholomew, Becca's is Martha, and Jonathan's is John the Righteous. 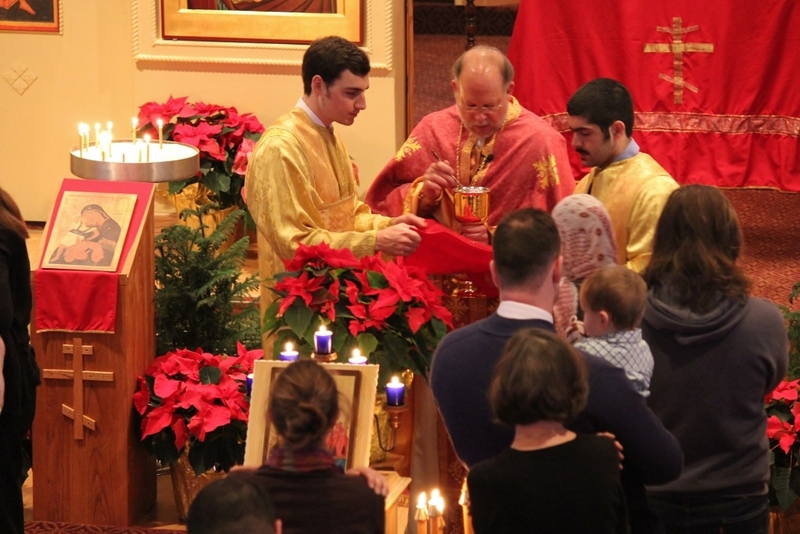 On Palm Sunday, April 20, we received two more catechumens into the Orthodox Fatih. Phyllis and Robert were received through confession of faith and Holy Chrismation. Phyllis' chrismated name is Marina; Robert's is Joseph the Betrothed. 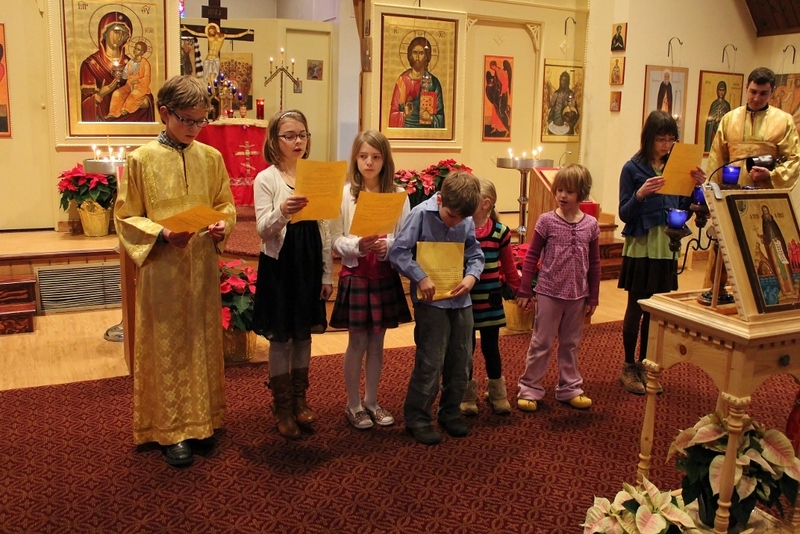 Great Lent 2008 ended with the reception of eight new converts and one newborn daughter into the Holy Orthodox Church. We are most grateful to God for blessing us with these wonderful people. They have already proven to be a blessing to our parish. An Orthodox icon is characterized by "inverted perspective." Through this means, the icon draws the viewer into the subject of the icon, and makes the viewer a participator in it. 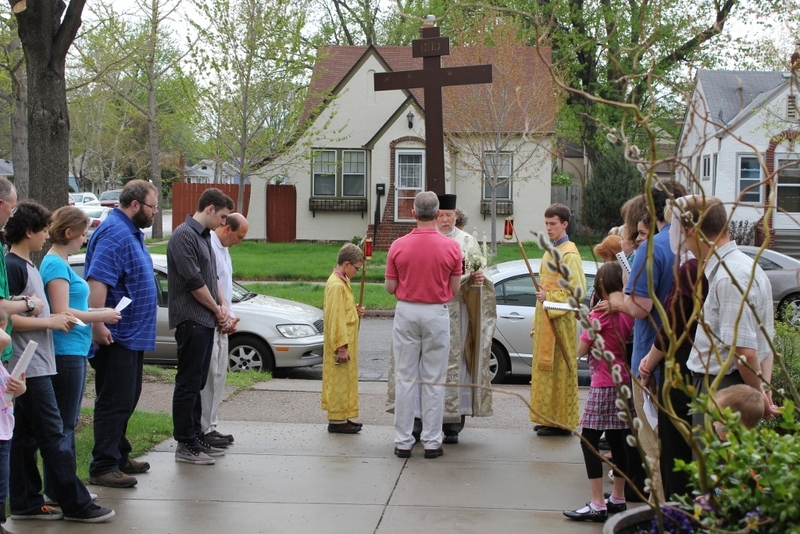 The services of Holy Week and Pascha are a liturgical icon that the faithful of each parish put together. The iconographer subjects his creativity to strict canons and traditions that have been handed down over the centuries so that the icon he produces is faithful to the Worship of the Church in Spirit and in Truth. Even so, the icon he produces is an expression of his own love for the Savior and reveals something of the particular iconographer's own soul. So also the faithful of each parish submit their creativity to the liturgical canons and traditions of the Church to produce their own liturgical icon of Christ's Holy Passion that is faithful to the one, holy, catholic and apostolic tradition of the Church; and yet the liturgical celebration of each parish expresses at the same time something of its parishioners' own soul, and their own love for the Savior. One might say that the ascetic disciplines of Great Lent function in a way similar to the "inverted perspective" of the Orthodox icon. 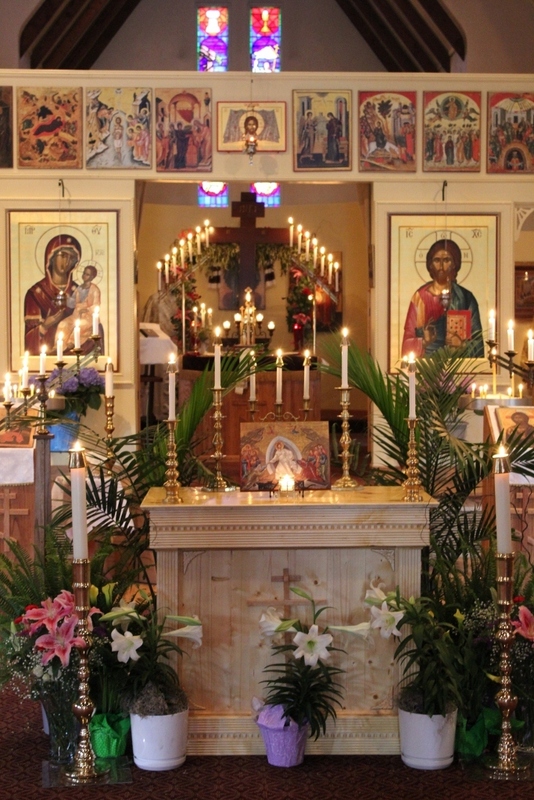 Through the ascetic disciplines of the Church, each of the faithful is able to enter mystically into the liturgical icon of Christ's Holy Passion that they produce as a parish, under the direction of the Tradition of the Orthodox Church. They make their liturgical icon as beautiful as they can, to express both their love for the Savior and also the mystical beauty of his Holy Passion. 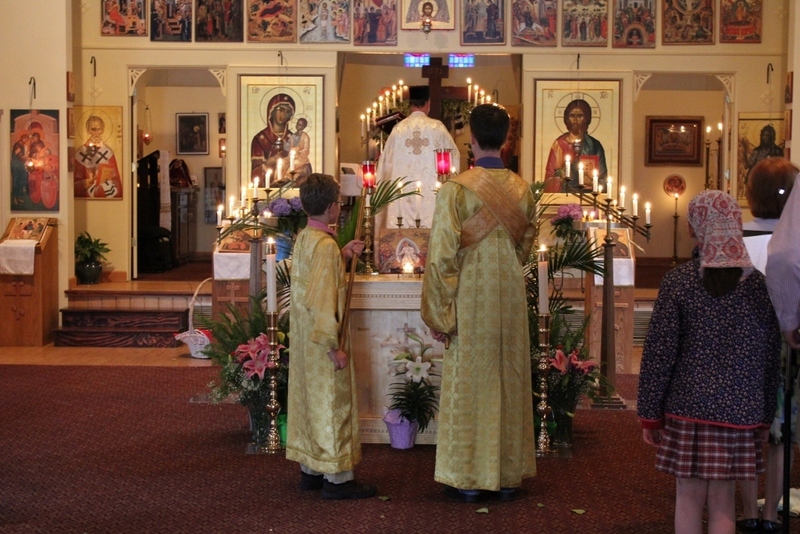 They practice the ascetic disciplines of Great Lent according to their strength, so that when they come to the liturgical icon of the Holy Week and Paschal services, they can enter its liturgical rites as through a gate and come into the mystical reality of the spiritual beauty that the liturgical icon renders "incarnate" - i.e., visible, audible, tangible, sensual. It is an icon of the crucified and risen Savior - the Bridegroom who comes at Midnight to give himself to us as food and drink. 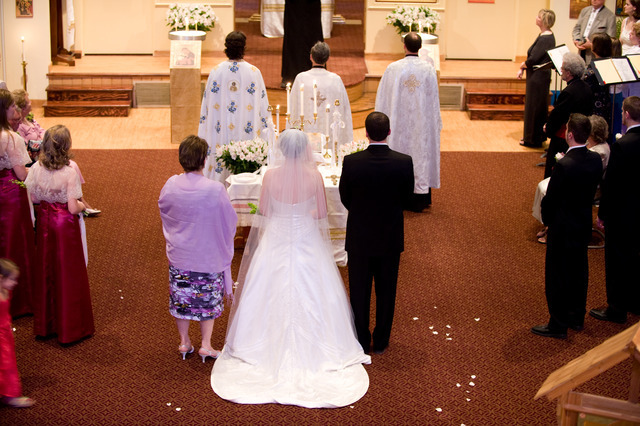 By means of the "inverted perspective" of the Church's ascetic disciplines, the faithful make their way to the bridal chamber of their heart, and there they prepare themselves to meet the Bridegroom "who comes at Midnight" in the expectant joy of becoming one with Him, and in Him, to become communicants of life eternal, partakers of the divine nature (II Pt 1:4). Fr Paul completed his series of lectures on "The Ontological Vision of Byzantine Theology," sponsored by Twelve Apostles Greek Orthodox Church and St George Serbian Orthodox Church in Duluth, on Tuesday, March 25 and Thursday, April 10. His lectures looked at the theological vision of the nature of God as that is revealed in the mystery of Christ's incarnation, and what that tells us about who we are, why we are here, and where we are going. The lectures took place at the College of St Scholastica on the Duluth campus. Fr Paul plans to offer these lectures at St Herman's in the near future. 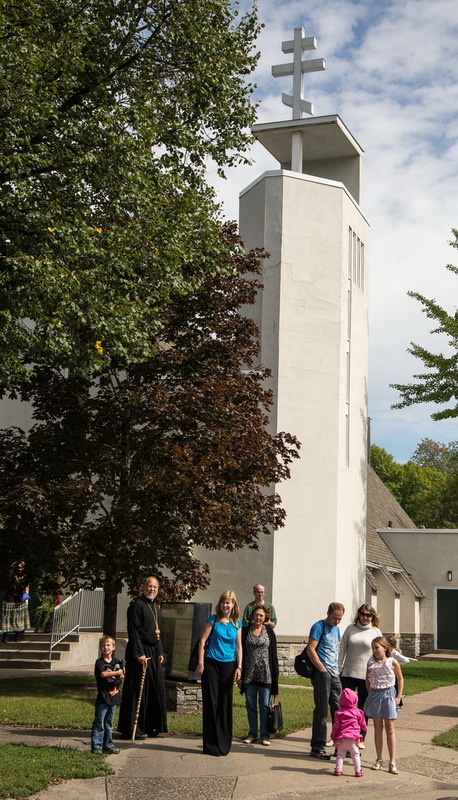 Each summer, parisihoners from St Herman's go on a pilgrimage to Holy Dormition Monastery in Rives Junction, Michigan. 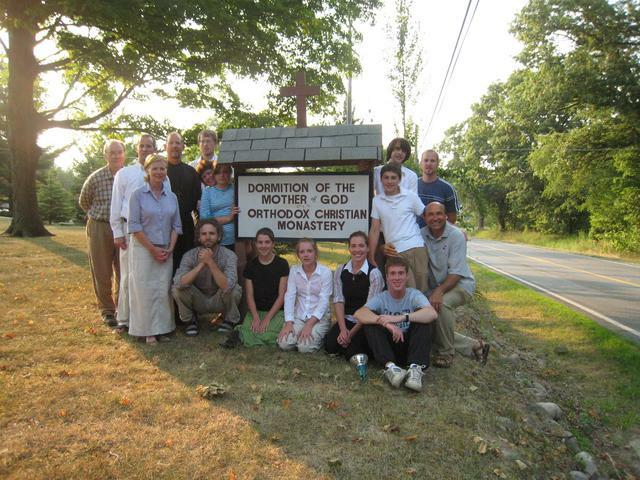 Our pilgrimage in 2008 will be July 29 - 31 (Tuesdy - Thursday). Certain parts of the rhythm of monastic life were more appealing than others. 1. to establish a spiritual connection between our parish and the monastery. 2. to absorb at least a little bit of the monastic spirit by becoming part of the monastery's rhythm of daily life, to deepen our own experience of the Church's Faith. we dug six 40" deep holes in the cemetery for cement foundations for the several hundred pound stone markers that will be placed at the head of the burial site. A cement truck came in and poured cement into the holes, and we helped "screed" the cement - smooth it out. We dug out a section of ground by the refectory and installed six cement slabs to create a sidewalk there. We raked out weeds and rocks in a newly-acquired section of the monastery property. 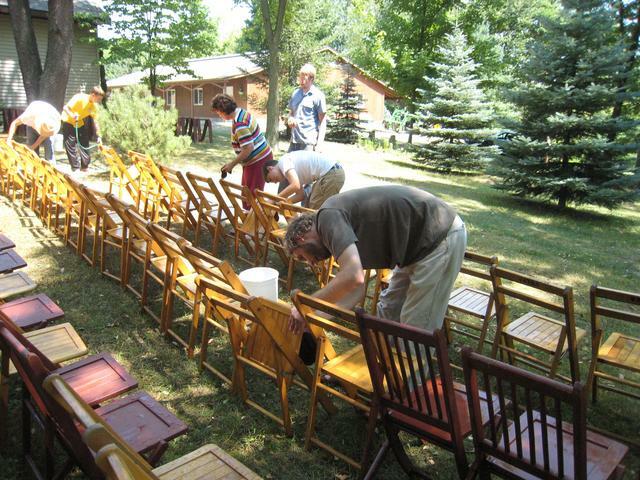 We moved several hundred chairs and several tables in the pavilion, hosing them down and washing them and restacking them, to get them ready for the Divine Liturgy to be served in the pavilion on the Feast of the Dormition when the monastery welcomes hundreds of pilgrims in honor of their patronal feast. We also power-washed the walls and cement floors of the pavailion. Wait a minute! Is that a golf club? 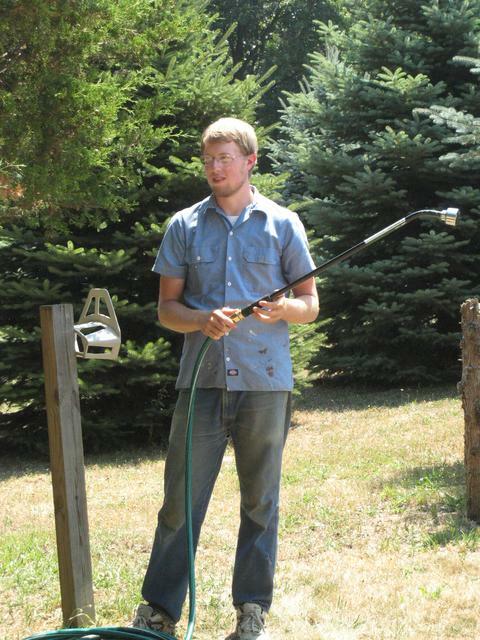 Actually, it's a water hose! Proof Positive that Fr Paul was working. He's the one taking the pictures. On Wednesday evening after dinner, Mother Gabriella came to the guest house and spoke to us, addressing such questions as: why do monastics wear black? How are they able to get by on so little sleep while they work so hard and pray so much? Do they ever wish they could return to worldly life? black symbolizes death to the old man and regeneration in the resurrection of Christ. 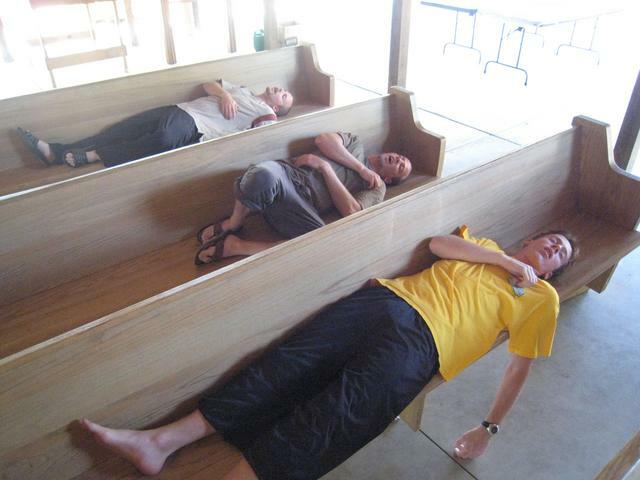 Monastics need little sleep because their minds are filled with the prayers of the Church that enable them to sleep in deep peace, so they don't need as much rest. Their diet, too, is healthy and not heavy and so it does not tax their bodies as does rich foods. They also rely on the grace of the Holy Spirit to help them. 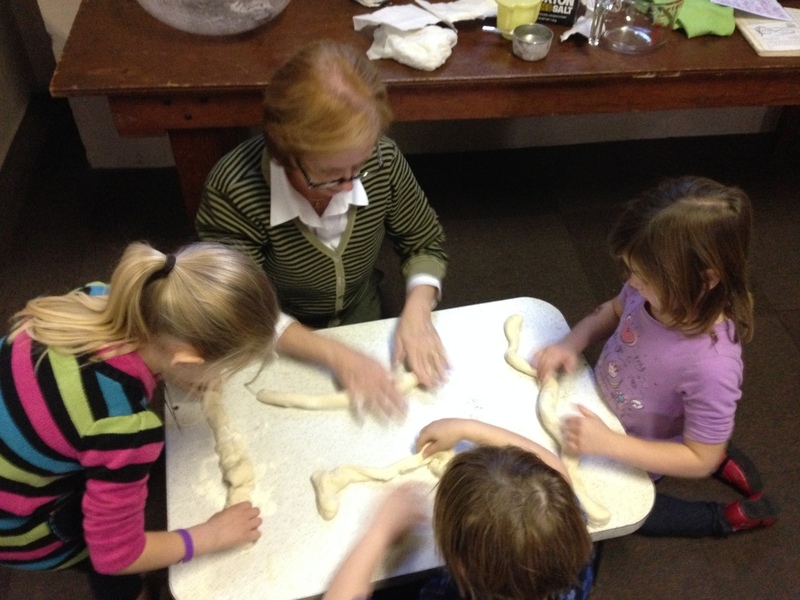 The monastic life is hard and demanding, but very rich and rewarding. 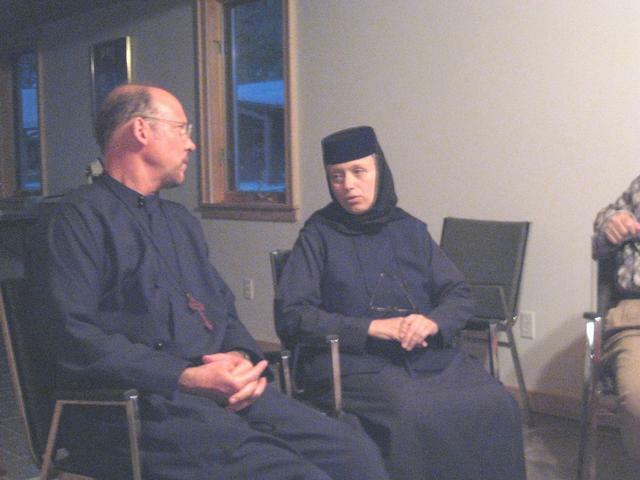 Monastics love the monastic life. We all fell in love with Mother Gabriella and with the mothers and sisters of Holy Dormition Monastery. We look forward to our pilgrimage next year! The icon was completed around Christmas. It remained for 40 days on the altar of the monastery church, just a few steps from the relics of King St Stefan (which Fr Paul venerated when he was there). It was then hand delivered to Nenad by Bishop Teodosije. Nenad kept the icon in his Belgrade office, waiting until he could find a safe and secure way to send the icon on to St Herman's. 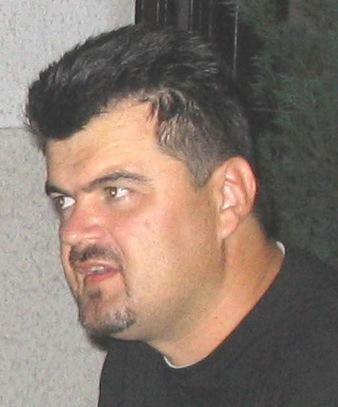 Shortly after Pascha, Jose Quinones of the IOCC office in Baltimore, visited the IOCC Belgrade office; and Nenad entrusted it to his care. Jose packed the icon securely in his carry-on luggage and kept it in his Baltimore office. Jose then handed the icon to Dan Christopoulos, IOCC director of development, when Dan came to the Baltimore office the first week of June. Dan packed the icon into his carry-on luggage and hand-delivered it to Fr Paul and Presbytera on Thursday, June 7. The point of the story is this: this beautiful icon has been relayed from the High Decani monastery in Kosovo to St Herman's, from one end of the earth to the other, wholly in the embrace of the Church. 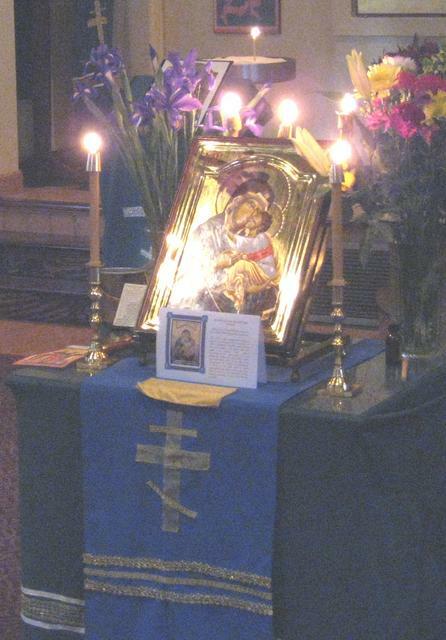 The icon was blessed at Great Vespers on Saturday, June 9. To say that the icon is beautiful does not do it justice. Standing before this icon of the holy Theotokos, one understands the difference between a religious picture and an icon. This is not a religious picture. This is an icon. MIDNIGHT. All Our Lights out! Come, Receive the Light (of Christ). Procession from the Empty Tomb into the Garden of Christ's Resurrection on the other side!